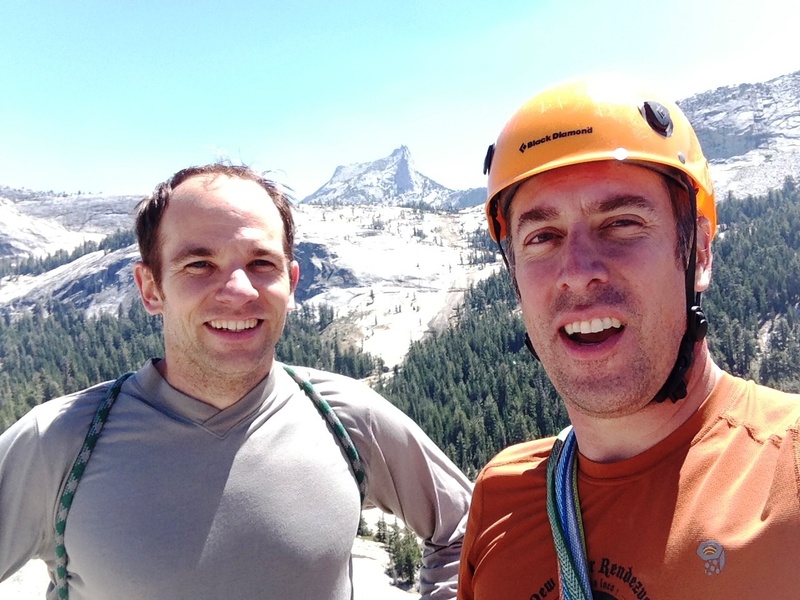 A couple weeks ago I spent the weekend in California visiting one of my good friends and original climbing partners Chris Graham. 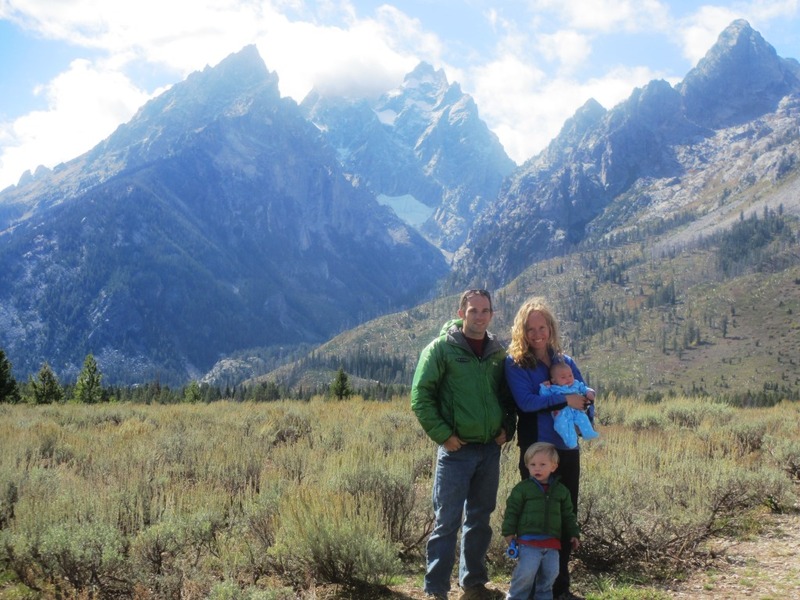 Chris recently moved to Sonora, which is ideally situated at the base of the Sierra range. There’s an overwhelming amount of rock in this area, and not just the ubiquitous pristine Sierra granite. 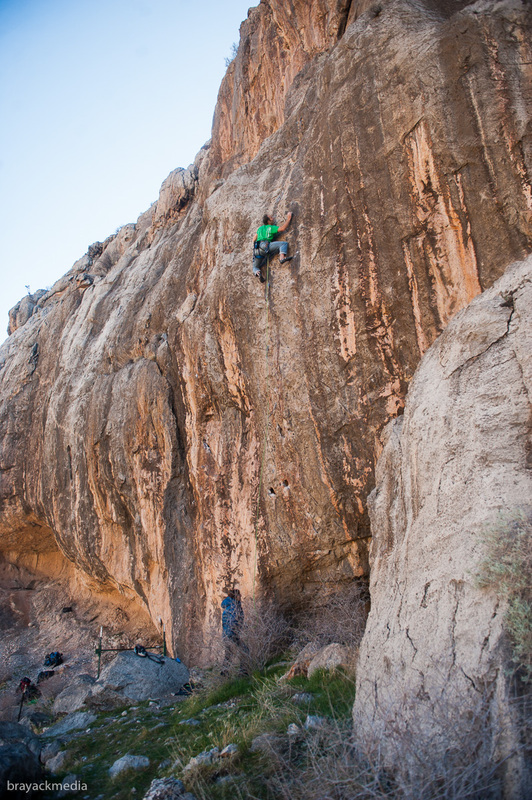 Sonora is home to a number of excellent basalt crags, including the sport crags of Jailhouse Rock, Table Mountain, and Columns of the Giants, and one of the more unique bouldering areas around, a marble crag of sculpted fins known as “Columbia”. However, since it was the dead of summer, with temps in the 90’s, all of those crags were out. I was pysched to head up high and re-visit one of my favorite alpine playgrounds, Tuolumne Meadows. 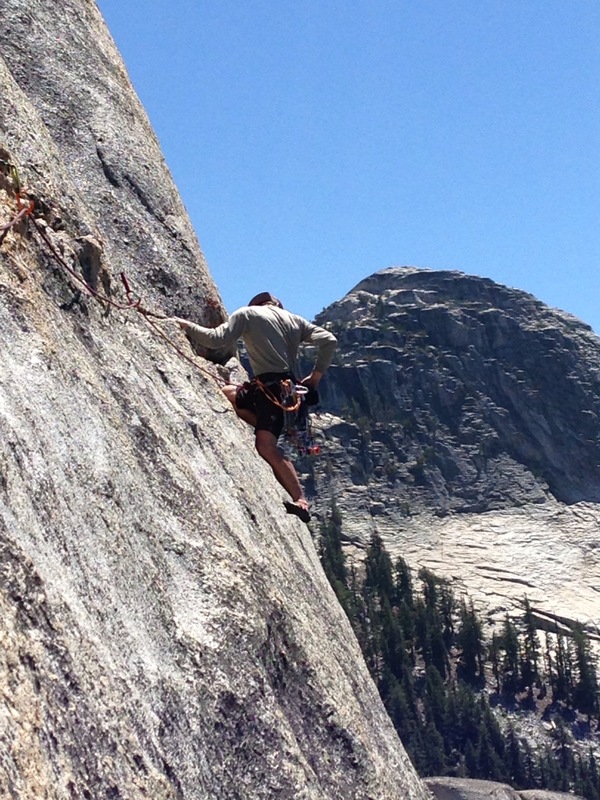 Tuolumne offers the perfect combination of adventure and accessibility. Many of the best crags are only a few minutes from the road, with quick approaches and straight-forward descents, making it easy to get a number of routes done in a single day. 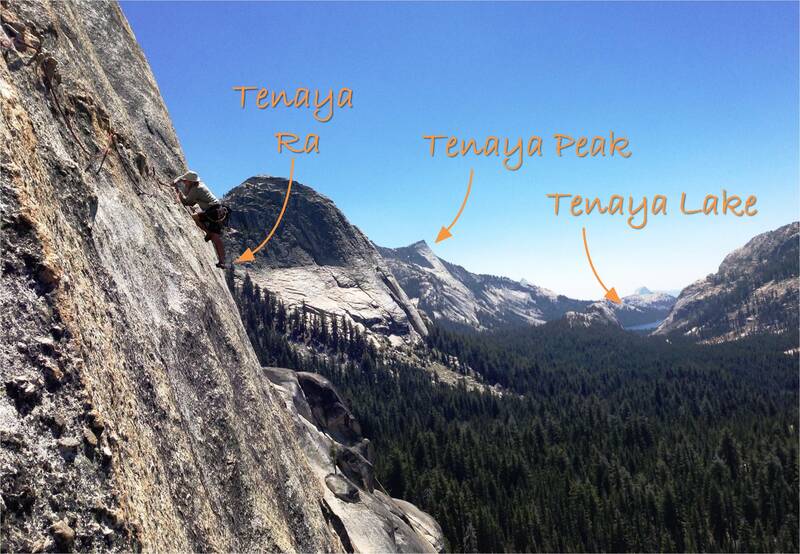 It seems like no matter what route you end up on, its hard to have a bad day in Tuolumne. 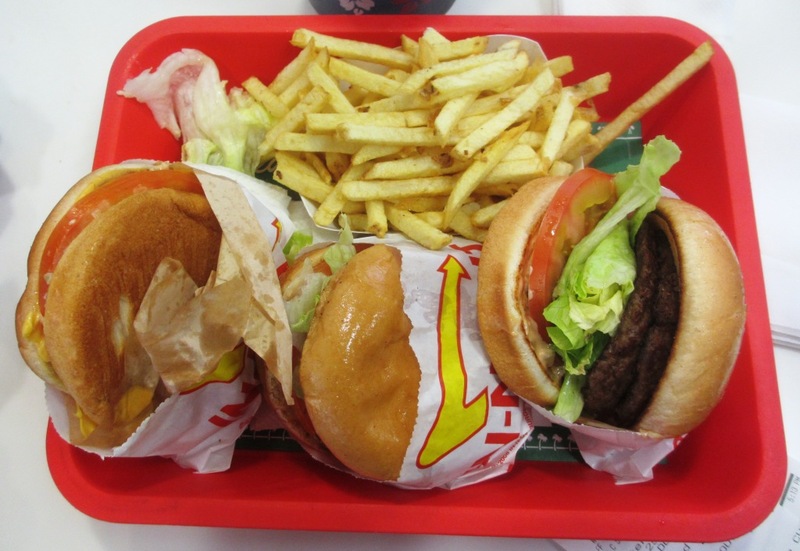 Its just too beautiful! The objective for the day was a pair of moderate classics that for some reason or another I had never gotten around to trying. Pywiack Dome is one of the first prominent rock formations you notice if driving in from the west. 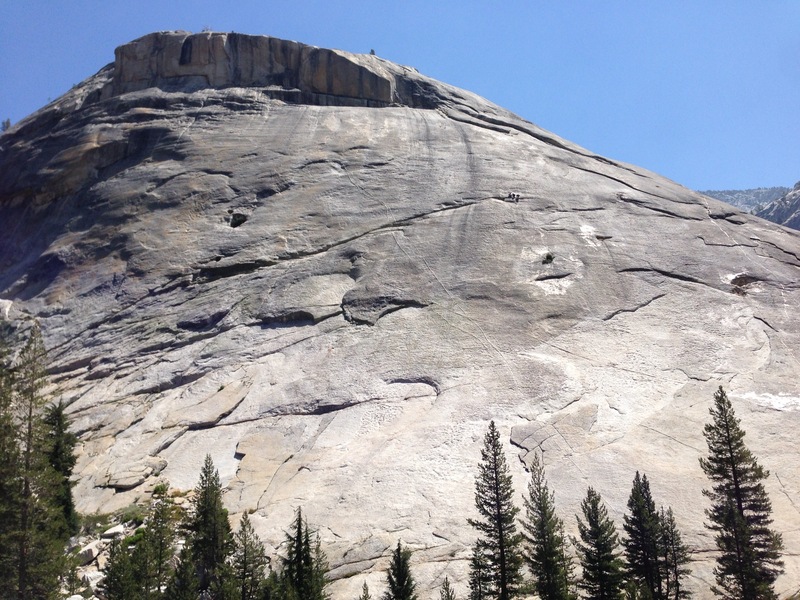 It sits right next to the road, and the base is actually 100-feet or so below the road, so you can look straight across at any climbers on the lower flanks. I had driven by this dome countless times and always fixated on a striking series of dikes that zigzag up the West Face. Me and Chris on Pywiack Dome. 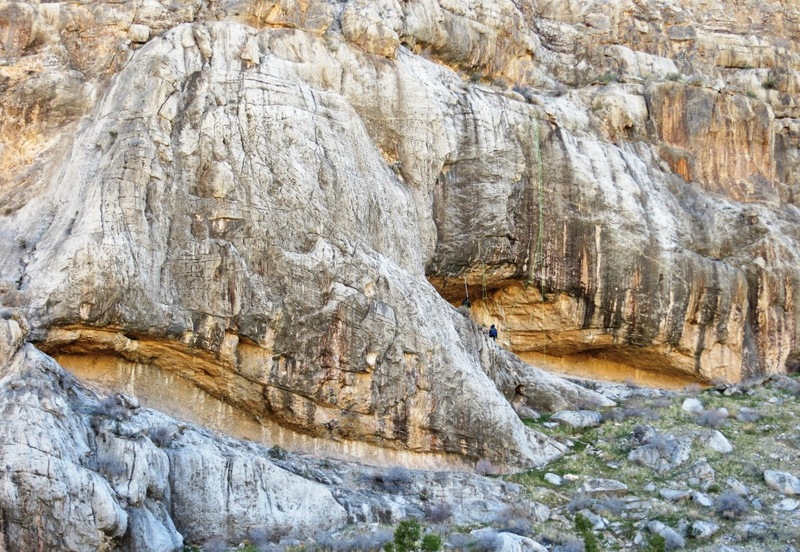 The Dike Route has a reputation for extremely runout slab climbing. For whatever reason I’ve always had a pretty good knack for that sort of thing, but I’ve found it requires the right kind of partner; someone you can trust in a tough situation, but also someone who keeps the mood light. 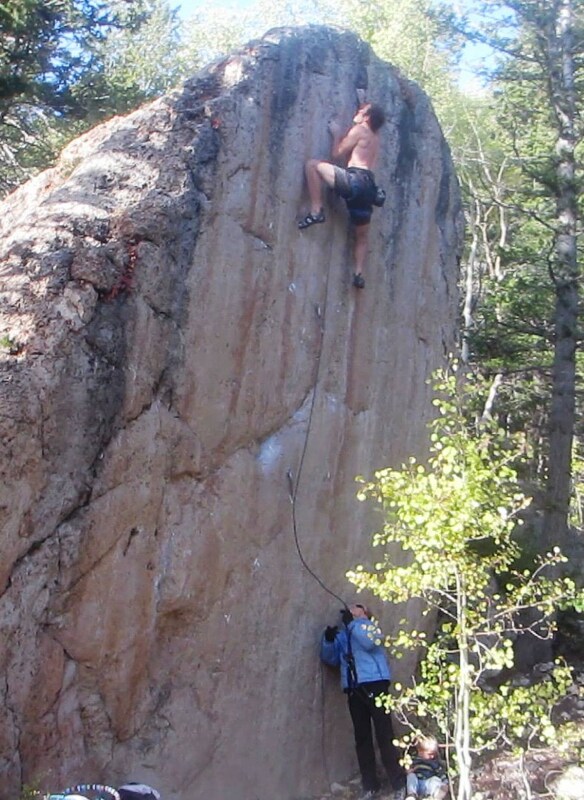 Extremely runout climbing is tense enough without a trembling belayer. Chris was just such a partner, “Down for whatever” as Ice Cube* would say. 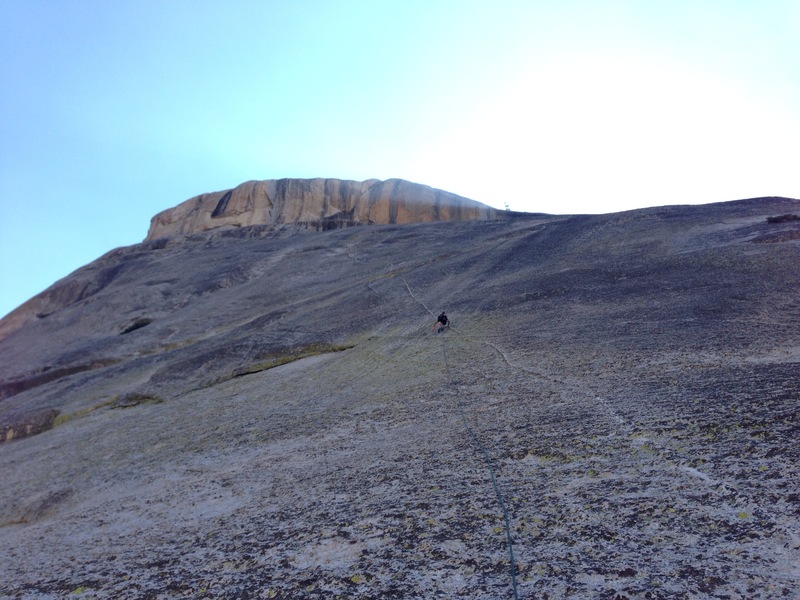 My old SuperTopo from 2001 calls this route the Bachar-Yerrian of 5.9 climbing, so I expected it to be a bit dicey. Apparently the mental crux comes on the fourth pitch, where a reasonably protected 5.9 leads to 80 feet of 5.8 split by a single bolt. Many folks fail to locate the key bolt, turning a hairy but survivable R-rated stretch into 5.8 X. My plan was to find the bolt. 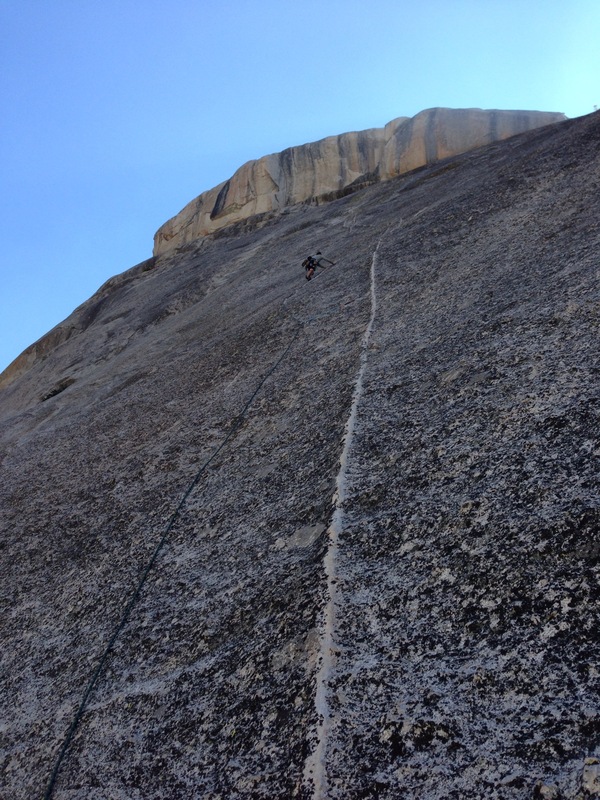 The route starts out with 120 feet of gearless 3rd/5.4 slab paddling to reach a nice stance. 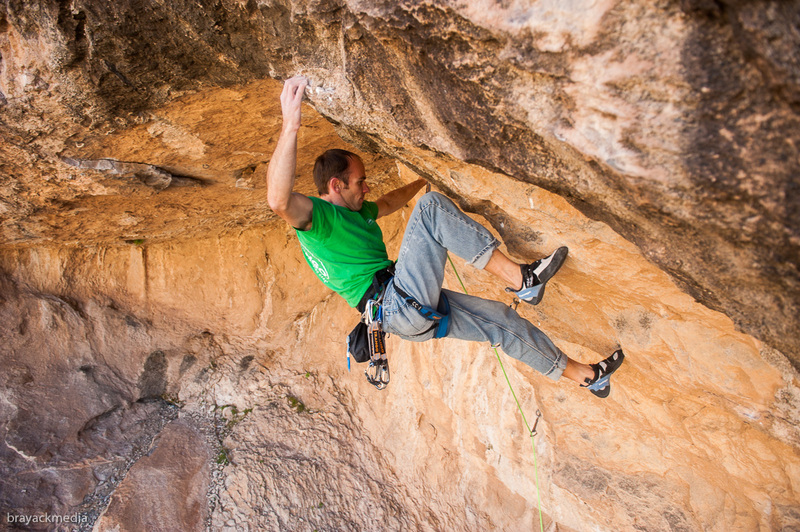 The 100-foot second pitch had infinitely more protection: 1 bolt, located about halfway up the pitch. 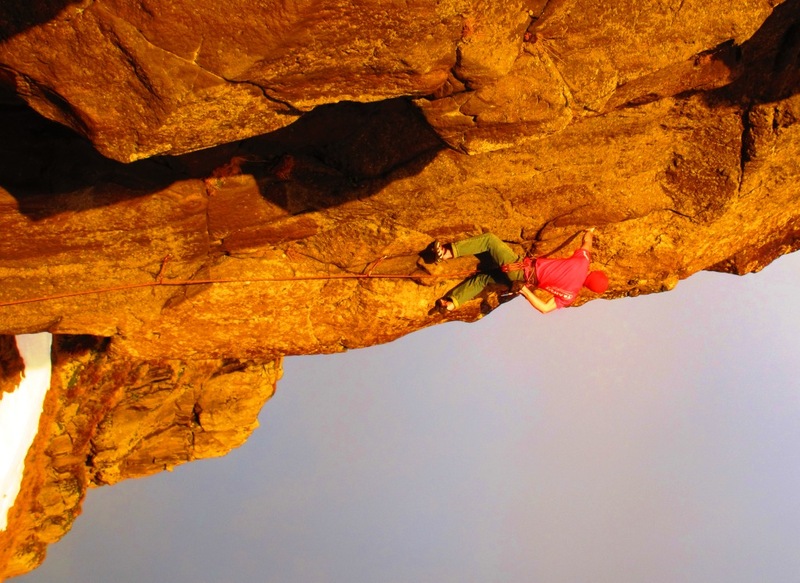 This route was bolted on lead, presumably without hooks, so the bolts were few and generally located at hands-free stances. The topo calls this pitch 5.6, and doesn’t mention any sort of crux at the top, but I found it to be the mental crux of the entire route. 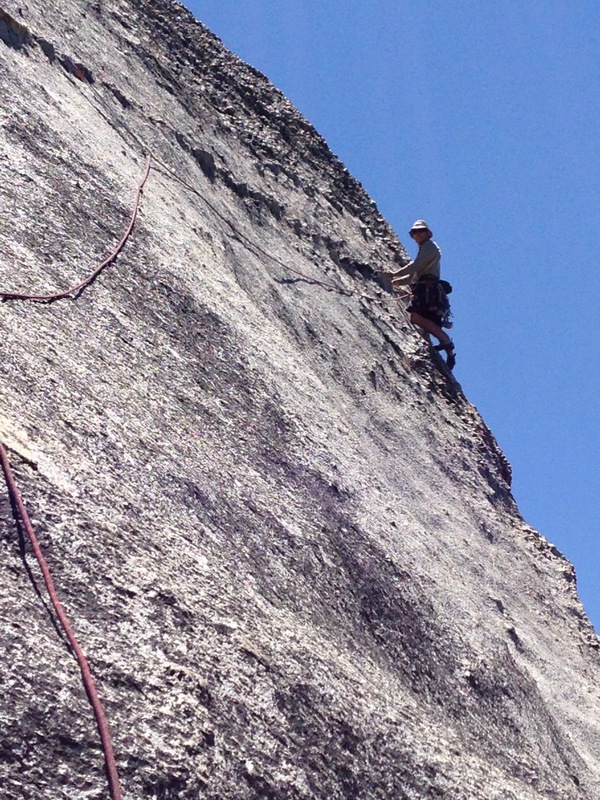 Within spitting distance of the belay stance the angle steepens just enough to make you doubt your rubber. Either I was off route or something broke, but I had to do some very commiting friction moves literally 50-feet about the lone bolt. This is the kind of situation where finger strength is useless; eventually it comes down to trust in your footwork. 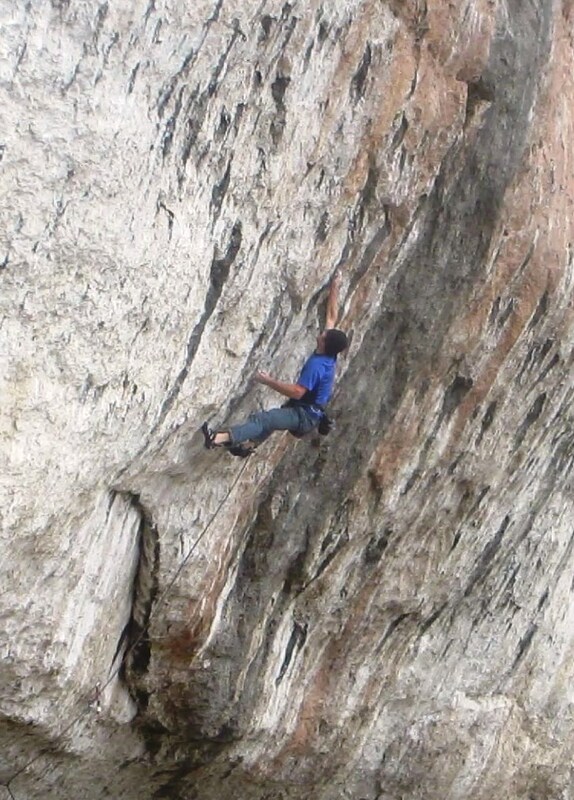 The second pitch, and the crux in my experience. At the belay I contemplated how we would retreat if I had to chicken out on the 5.9 pitch. Fortunately the 3rd pitch was essentially grid-bolted, with three bolts in 100-feet. This was a really cool pitch, weaving between twin dikes. At one point you “walk the dike” with your feet on the left dike and your hands on the right dike. It was really fun and not at all scary. By the end of this pitch I was feeling much more confident. 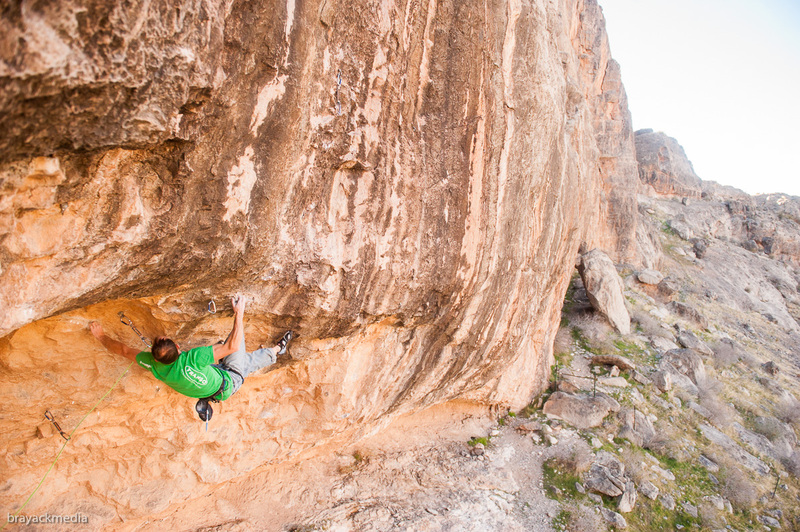 The crux fourth pitch begins with a tricky mantle to reach a bolt, then some commiting 5.9 smearing to clear a bulge. Above this, the dome is covered in a sea of shallow, polished knobs. The sun came over the top of Pywiack Dome just as I pulled onto this section, and all the knobs were highlight by sun and shade. At this point I began my search for the key bolt. All the shadows on the rock made it impossible to pick out a tiny steel hanger. Suddenly it occured to me that, considering the history of the route, I should be looking for a free stance, not a bolt. I immediately noticed the only scoop in the entire face and quickly located the bolt five-feet above this stance. I gingerly made my way to the bolt and clipped. By this point I was a granite slab-smearing master and I made quick progress over the glassy glacier polish to the top of the slab. 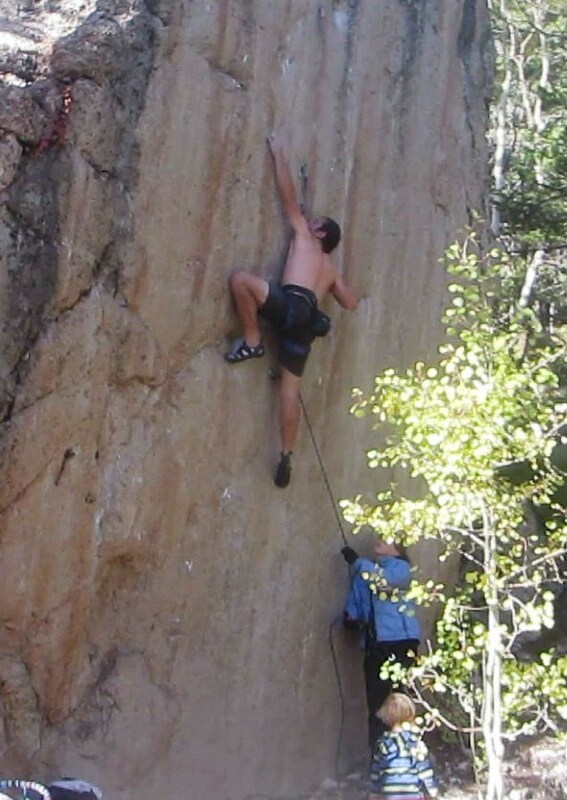 Beginning the horizontal traverse. Once you turn this corner the ground drops away and the route becomes fantastically exposed. 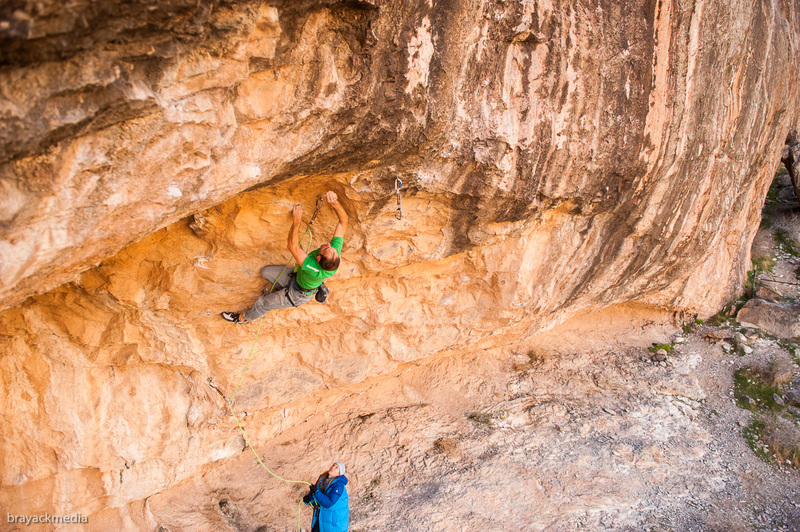 The route starts with a couple hundred feet of scrambling, fourth class and low 5th class climbing to reach an amazing horizontal crack about 300-feet off the deck. The crack follows a heavily featured dike, offering some of the best chickenhead jugs I’ve ever seen. 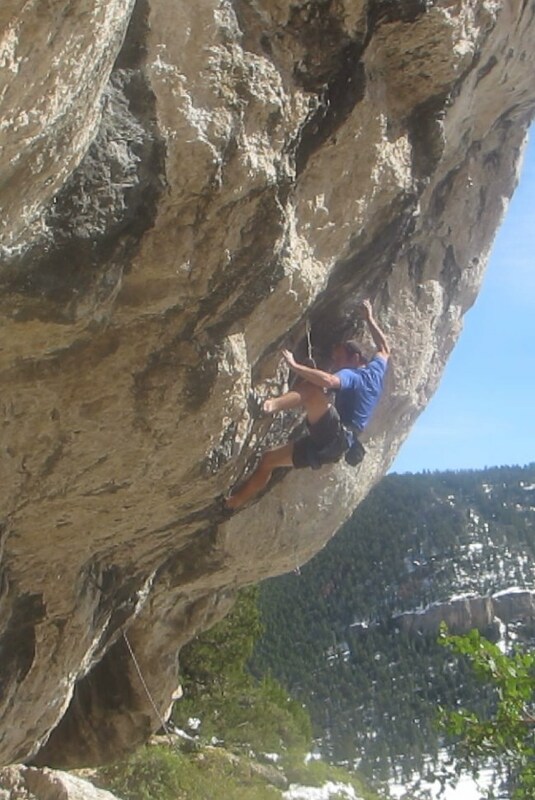 Most of the time there are enough footholds that the climbing is super fun and casual, but every now and then the footholds disappear entirely, leading to a hasty dash to the next good stance. Its always a good idea to ditch the big gear early; looking for a nice pod to deposit my #8 Flexcam. 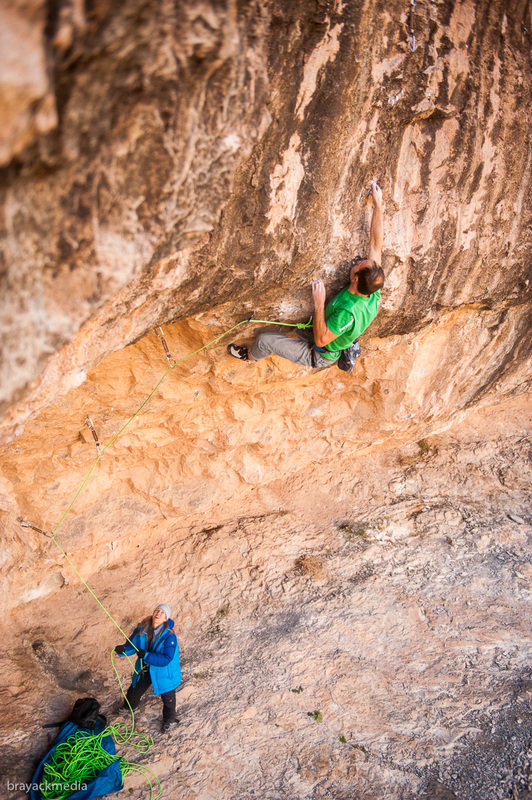 The crux for me was certainly protecting the traverse for the second. I wanted to get gear in every ten feet or so, but the crack is surprisingly uniform (right around 3/4″ with only a few variations) and the pitches averaged almost 150′ in length. My rack wasn’t very deep, so I had to be creative and I spent a lot of time fiddling with nuts. By the time we reached the end of the fourth pitch we had done enough traversing to last us for a few years. We stopped on the descent to watch a party climb Oz, a classic 10d crack climb, then headed to the General Store for It’s Its. An ice cream sandwich covered in chocolate. Mmmmm. The next day was designated for Frolfing (Frisbee Golf). Chris is a 5.13 Frolfer. He’s got a monster drive and he’s a very good putter. I’m about a 5.11 Frolfer I would guess. 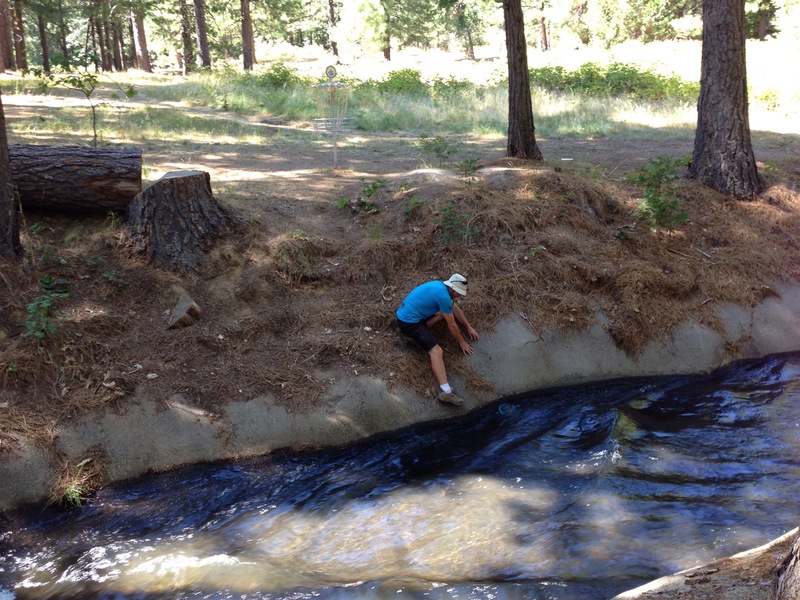 We played a really fun course near Sonora that follows an old irragation canal through a cedar forest. We played two rounds, which I will summarize thusly: The course crosses the canal twice, so in our two rounds I had to throw across the canal four times. I managed to throw my disc in the water twice. Even Chris’ dog Hera only fell into the canal once. Fortunately we were able to extract both Hera and my frisbee each time. Putting my smearing skills to good use. 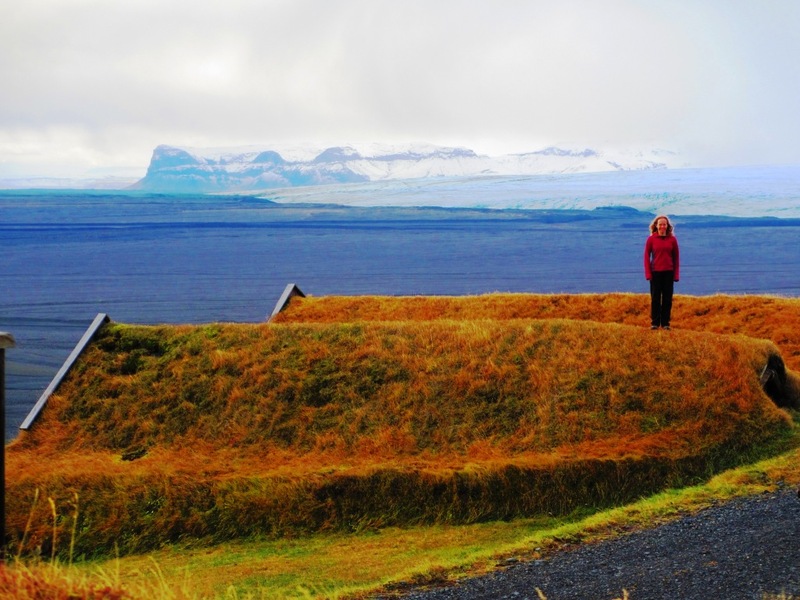 If you haven’t read “Iceland Part I” (or you thought it was so awesome you want to read it again) check it out here. 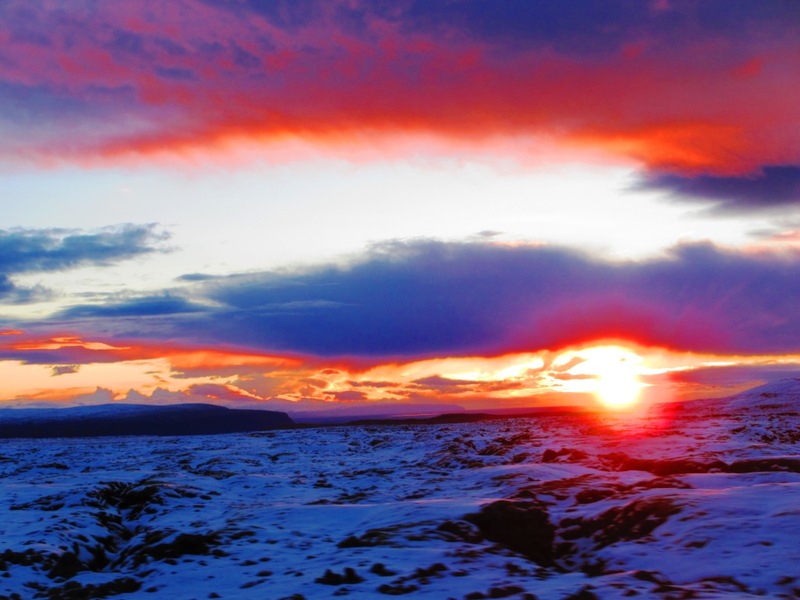 Sunrise over snow-covered lava fields along Highway 1. Day two started out slowly with us sleeping in till 9am. We slept 12 straight hours, probably for the first time since Logan was born. 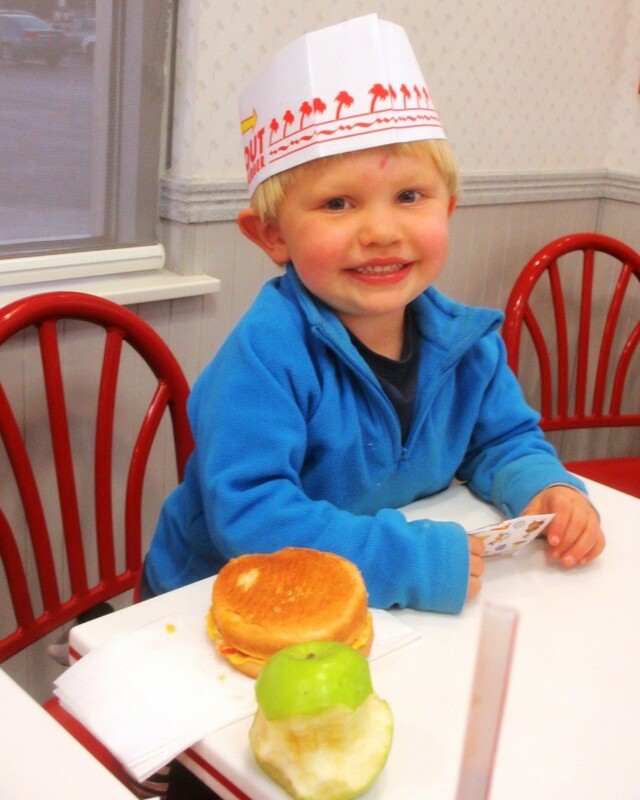 It was perhaps the highlight of the trip. This was going to be a big day. 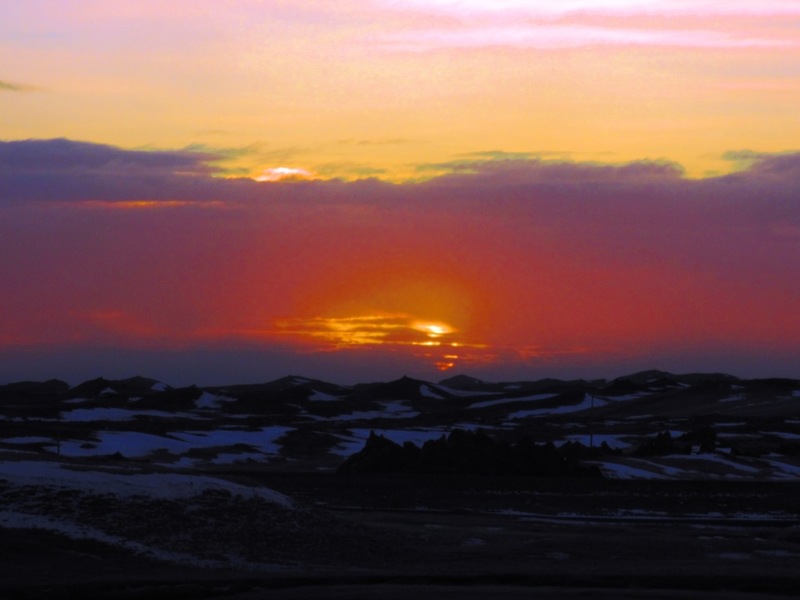 There are a number of worthy sites in the southeastern quadrant of Iceland, so we were going to try to drive as far east along Highway 1 as we could get before sunset. Originally the plan was to secure lodging wherever we wound up, but the latest forecast forced a change in plans. Reykjadalir Geothermal Area. We soaked in some hot springs here on the return trip. 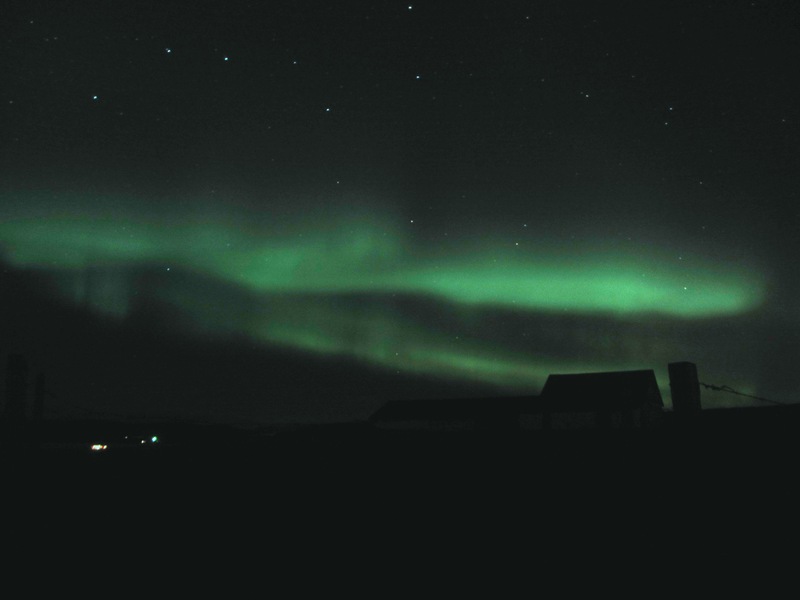 The ability to see the Northern Lights hinges primarily on two factors, cloud cover and auroral activity. The latter is hard to predict (although NASA’s NPOES satellite provides near-real-time data that can be used to make dubious predictions). As for the former, Iceland’s weather service provides detailed cloud cover predictions in 3-hour increments. Obsessive analysis of these predictions told us we needed to spend the night in Kirkjubaejarklaustur, about 150Km west of our day’s eastern turn-around point, so we would be much more hurried than we wanted. Mt Eljafjalajokul from Highway 1. This is the volcano that erupted in the Spring of 2010, causing weeks of mayhem for European air travel. The upside to our late start was that we could finally enjoy the landscape around Reykjavik, which we had only previously experienced in darkness. 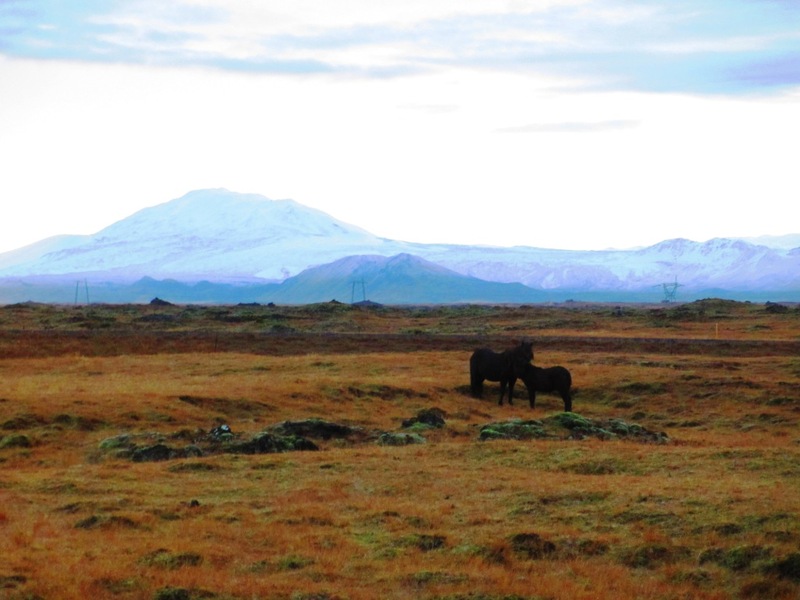 The landscape in Iceland is stark, or perhaps even bleak at times, but it is always interesting. 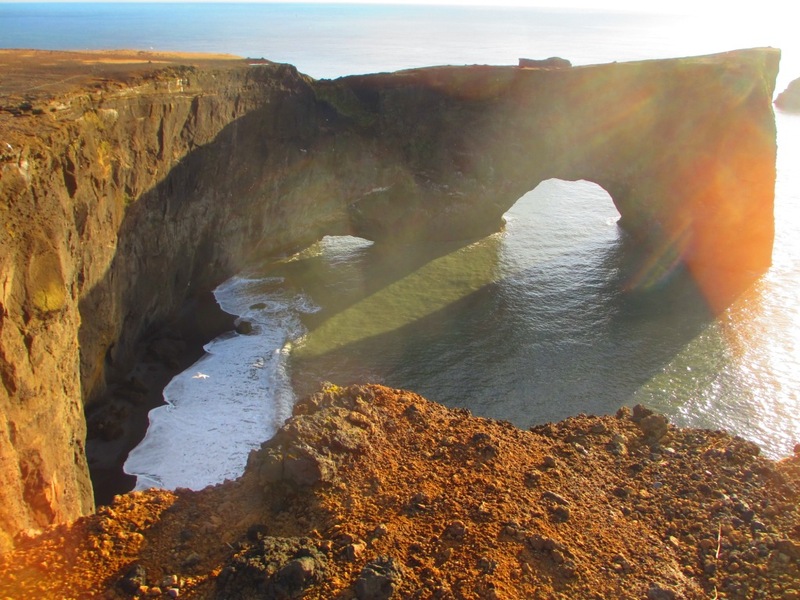 Hwy 1 winds and twists through rolling hills, and you are never more than a few minutes from a beautiful waterfall, striking rock formation, or sparkling glacier. We passed a number of amazing waterfalls (more to come on this) and glaciers. As an avid rock-starer, the highlight of the drive for me was an amazing rhyolite rock arch I spotted along the highway just east of Kalfafell. We didn’t have time to stop, so I planned to stop on the way back to hike up there and assess the rock quality, but I failed to note its location and we didn’t find it on the way back. 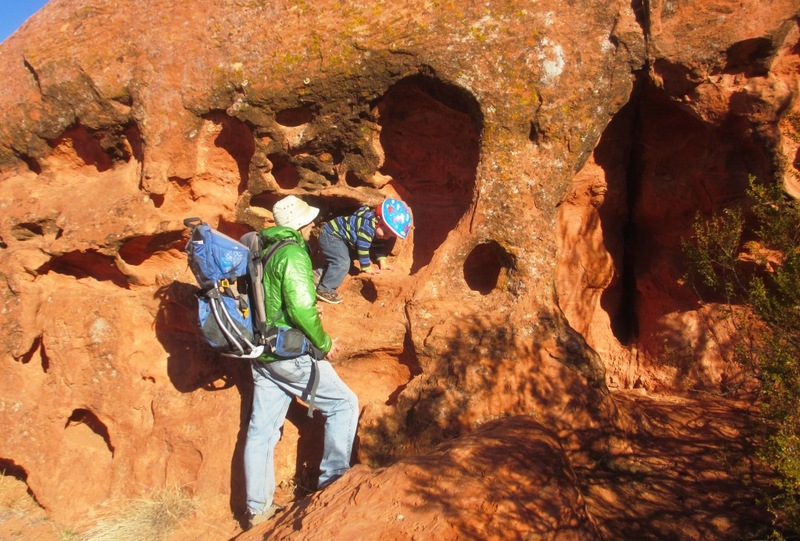 I hiked up to another cliff a ways further west and it seemed like it would be climbable, but would require an adventurous spirit and a good bit of cleaning. Kalfafell Arch. This thing is huge, probably 50 feet or more at the apex. After Kalfafell comes the enormous Skeidararsandur, which is basically an enormous (20 mile wide) sand flat covered by a spaghetti web of rivers delivering Vatnijokull’s runoff to the sea. 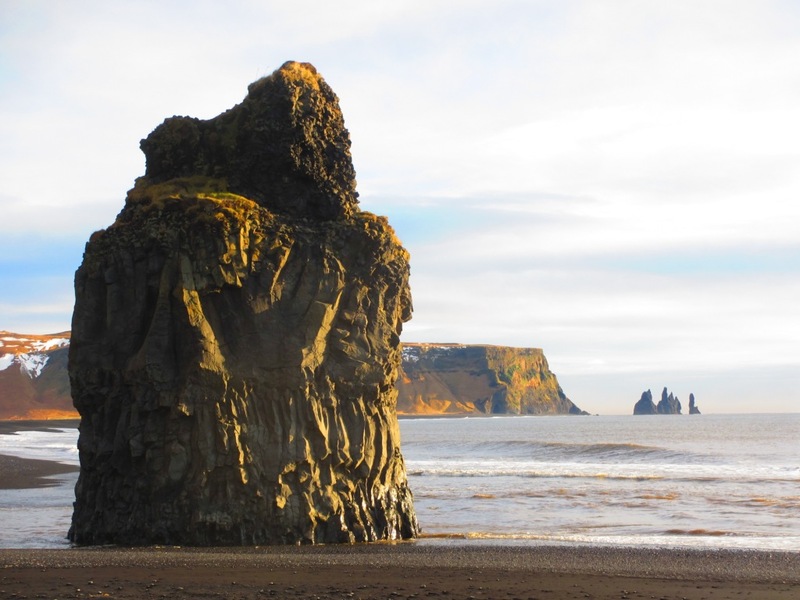 The sand in Iceland is all black, and its an unreal setting, with visibility for miles and miles. The amazing thing about the glaciers to me is how accessible they are. I’ve spent plenty of time on some big glaciers and ice caps in Alaska and Canada, but it always seems like it takes a mini-expedition just to get to them. 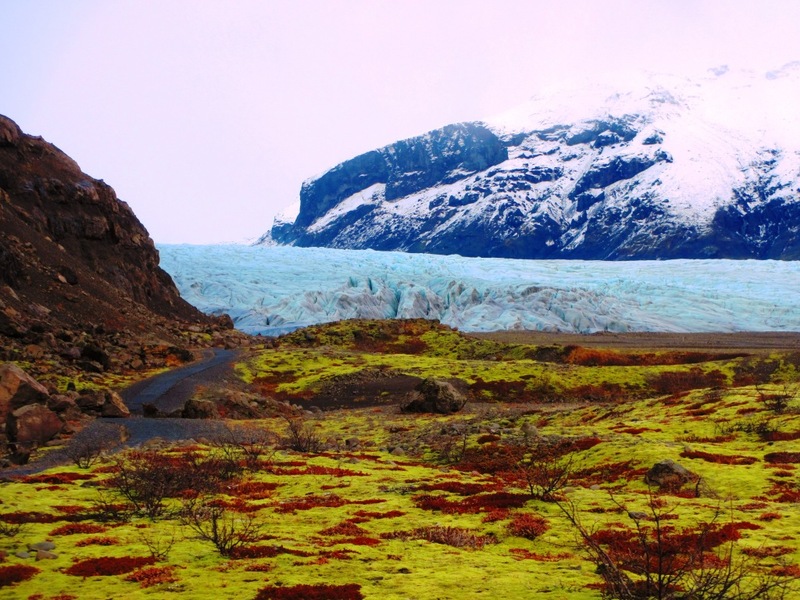 The glaciers in Iceland are everywhere, and its eerie to drive along a busy highway, passing almost suburban neighborhoods, with enormous seas of ice in the background. 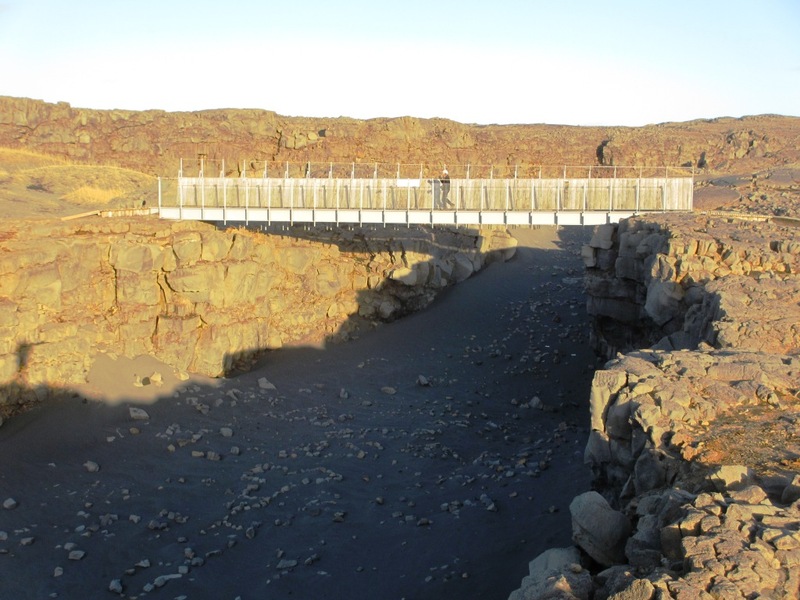 The first objective for the day was Skaftafell National Park, gateway to the mind-boggling Vatnijokull (‘Water Glacier’). 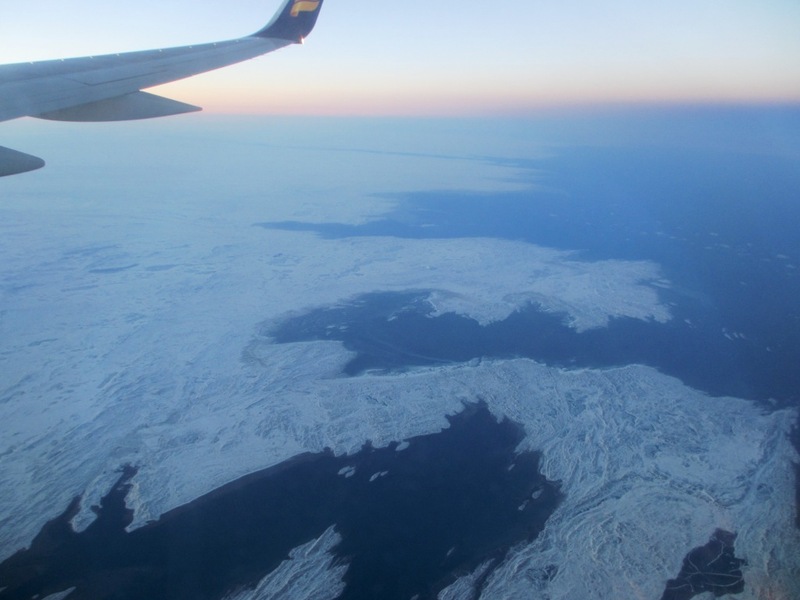 The term “sea of ice” gets bandied about, but this thing is bigger than the state of Delaware, and its omnipresent to anyone traveling in this part of Iceland. Its more visible than the nearby Atlantic Ocean, and almost seems bigger. Svartifoss. 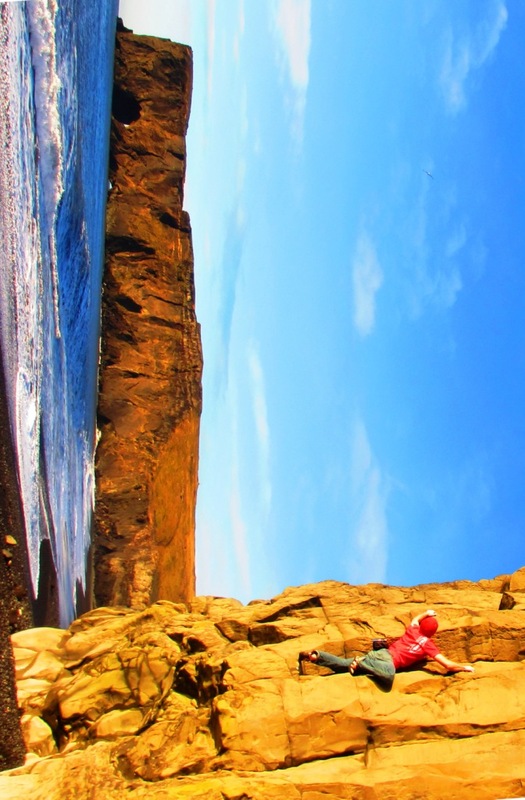 This cliff has impeccable overhanging basalt, but the water and conspicuous location would make it an un-wise climbing objective. Surely there are other cliffs like this waiting to be discovered. 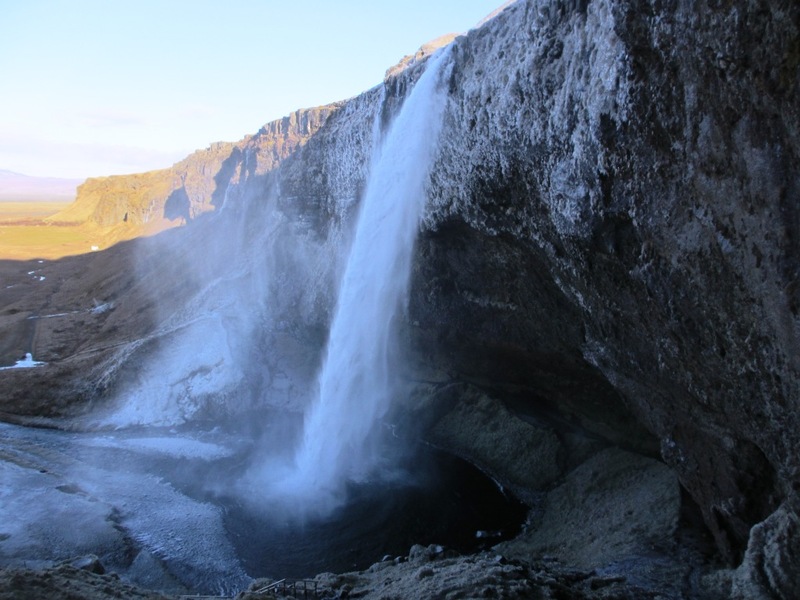 There’s a lot to see in Skaftafell, but at the top of our list was the remarkable Svartifoss (“black falls”) and the turf house village of Sel. If we had time, we were also hoping to set foot on Vatnijokull for no particular reason. The hike to Svartifoss was nice; our first real exercise in several days, and provided gobsmacking views of the nearby glacier tongues. Sel was completely unspoiled, and all the doors were open allowing use to poke in and out of the houses and underground stables. The barren landscape provided a real appreciation for the courage and perseverance of the early Viking settlers. We jogged the short path to the glacier, and had a fun time routefinding through the gnarled moraine to reach the ice. I was champing at the bit to get to Hnappavellir, Iceland’s premier sport climbing destination, so we snapped a couple pics and headed back to the car. It was a bit of an adventure getting to the cliff. 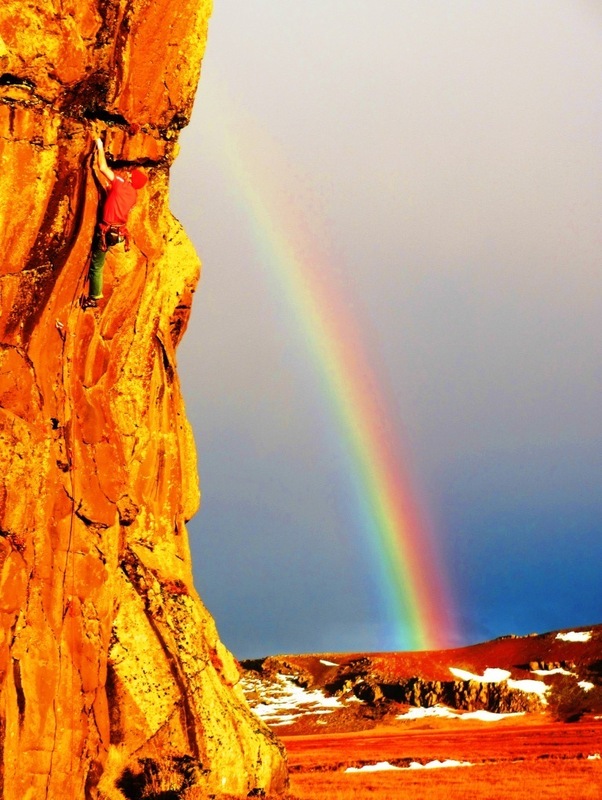 This is a summer crag (frrankly, every crag in Iceland is a summer crag). I didn’t even know if we would be able to climb, but we have a lot experience visiting distant crags at the totally wrong time, so I thought we would have a good chance. The most pressing problem was the swampy nature of the surrounding fields. You could see countless puddles glistening in the sun, and I was not looking forward to driving down the sketchy, soaked-mud roads that lead to the crag. Fortunately the west end of the cliff is near an old air strip, which has a nice gravel road we could take to get within a 100 damp yards of the cliffline. The ‘Skjol’ Sector from the car. 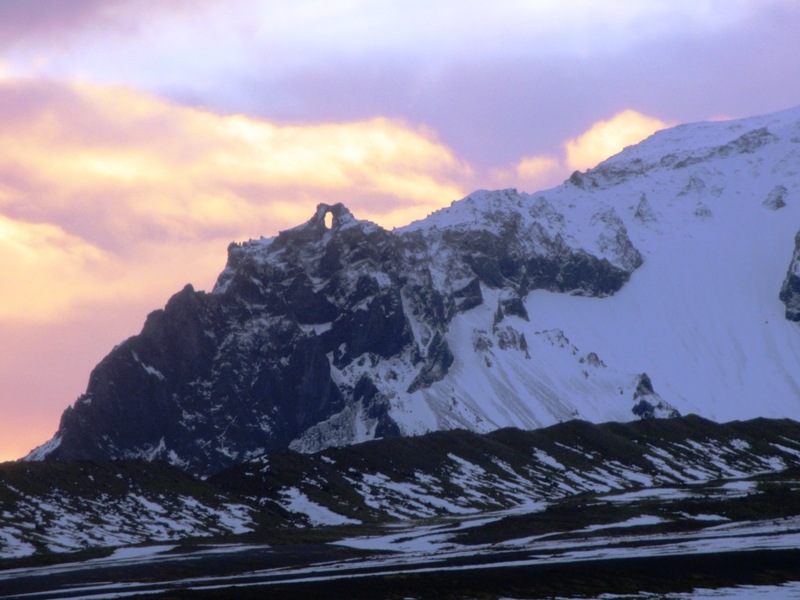 The highest peak in Iceland (2110m) is partly visible behind the cliff. The first crux was to leap across the narrow creek, then we had to hop across the marshy field. I devised a clever scheme to leap between raised tufts of grass, which resulted in totally soaking both of my feet. Fortunately this particular cliff sector sits up on a small rise so the ground under the routes was dry. This sector only has seven established routes, and it looked like they were all wet to some degree, but a couple were mostly dry. I started on a brilliant 5.11, which started on a slight overhanging up amazing, hidden, sculpted water pocket jugs. The climbing was super fun with gymnastic long reaches and heel hooks between huge jugs. Every time things were about to get tricky a seemingly shallow hold would reveal a sinker jug. 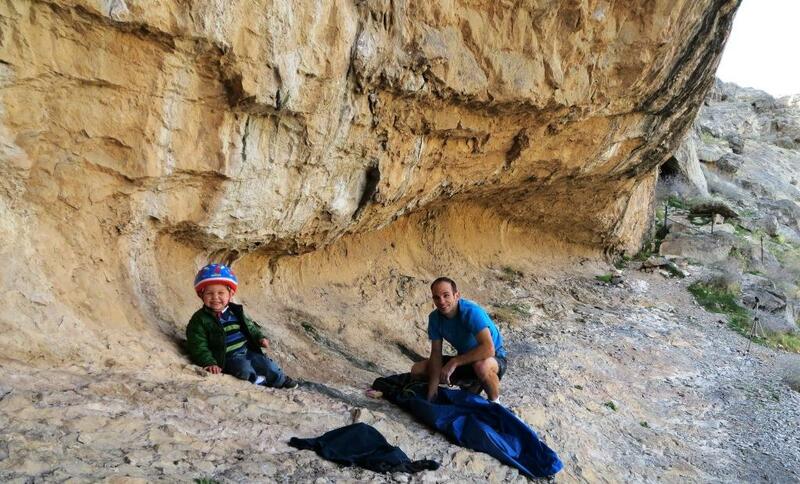 Next I tried a cool-looking 5.12 arete. 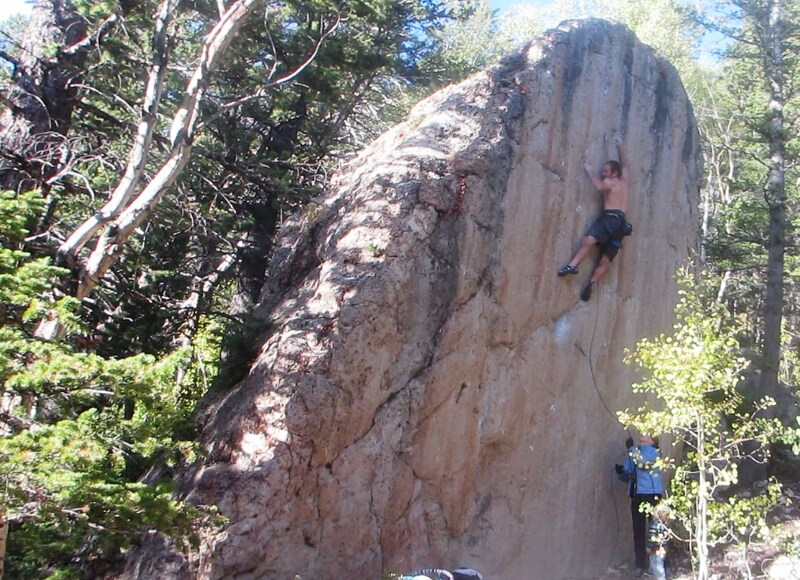 This one was pretty wet, and I had to avoid a lot of holds to keep my hands dry. Not as good as the previous line but still fun and cerebral. We still had one major objective another 50km down the road, so with light snow falling we packed it in. I would have loved to climb more at this intriguing place, but we were clearly here in the wrong season, and we didn’t really have the time to stay longer anyway. This is one of those crags that just has a nice vibe. 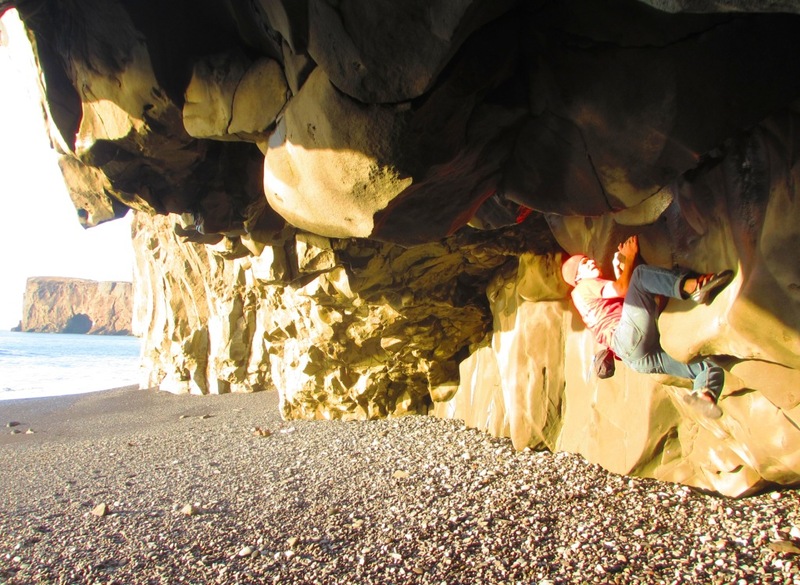 Basking in the sun, with a nice grassy base; its just a great hang, and throw in really fun climbing on great rock and it all adds up to a great experience. I hope to have an oportunity to return here (in the summer!) some day. 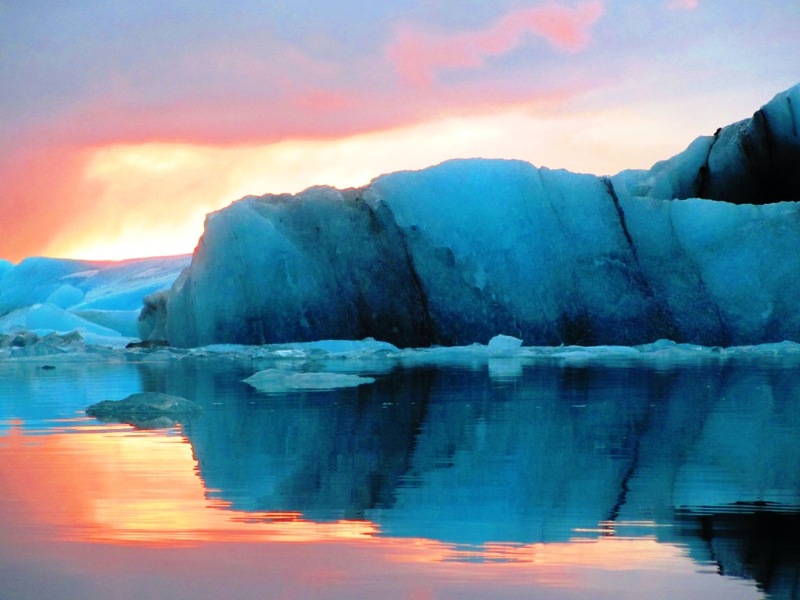 “Jokulsarlon” translates to Glacier Lagoon, and this is one of the coolest spots in Iceland. Its a small lake situated at the toe of the Breidamerkur glacier tongue, with a short river at the south end flowing a few hundred yards directly into the Atlantic Ocean. 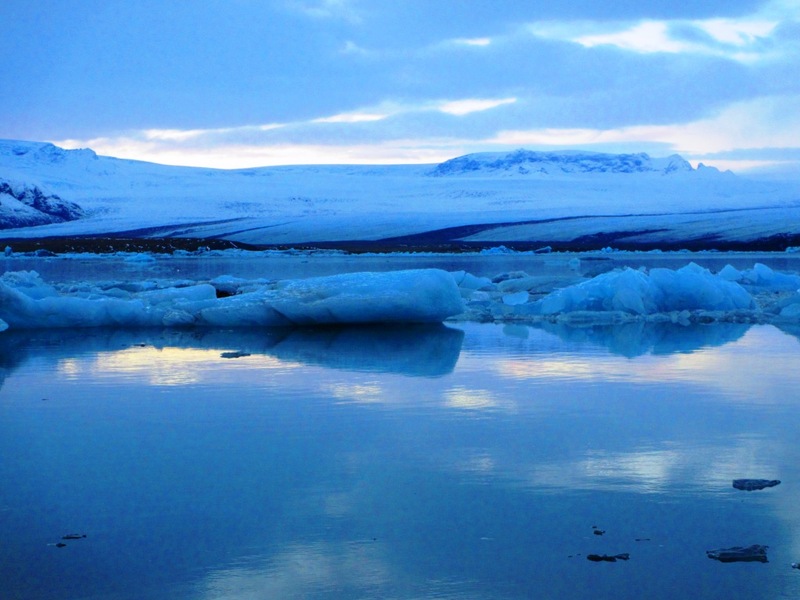 The lake is full of beautiful sculpted icebergs, and we were fortunate to arrive just before sunset. My favorite part of Jokulsarlon was watching the icebergs flow into the ocean. It really brought home the “tip of the iceberg” metaphor, as seeming small blocks of ice would constantly high-center on the river bed, creating temporary heaving ice dams. When the bigger swells hit the ice blocks would break free and continue their journey to the sea. Sculpted ice blocks on the beach. 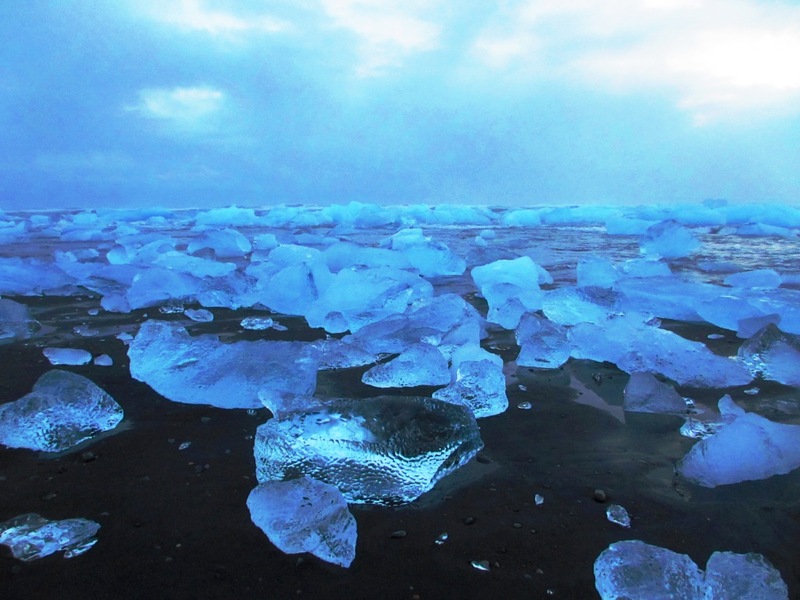 The nearby beach was littered with ice blocks of all sizes, creating some outstanding photo opportunities. I convinced Kate to stand on one of the flat icebergs nearest the waterline so that it would look like she was in the ocean when the next wave came in. This worked out a little too well as the next wave was a doozy, and it looked for a while like she would have to wade through the icy sea to get back. Kate standing on an iceberg! Next we headed to our hotel in Kirkjabaejarklaustur. Long story short, we stayed up for hours and never saw the Northern Lights (though we did see some amazing stars). It was completely clear, and we could see a really faint glow to the northeast, but that was it. According to NASA if we had been about 100 miles further north it would have been brilliant. We had one night left to accomplish our primary goal. Would we be so lucky?? Tune in next week to find out! Ya, that’s right, Iceland. Why wouldn’t I go to Iceland? In the winter. Alas, this was not a climbing trip per se, but I did manage to climb three out of the four days we were there. Ya, that’s right, we went to Iceland for four days (technically we were only there for 83 hours). Why would anyone stay any longer? Especially in the winter. 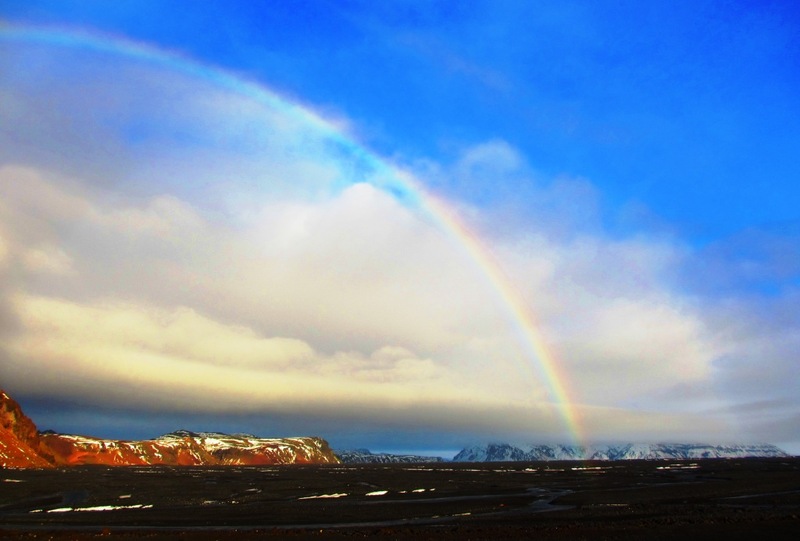 “Why Iceland?” This is the most common statement you hear after uttering the words “we’re going to Iceland”. Well, Kate has this friend with a bit of a Carrie Bradshaw complex (those of you with girlfriends know what I’m talking about), which is beside the point, but anyway, she was visiting over the summer and told us about a friend of her’s who works for Iceland Air selling travel packages to gullible Americans. Apparently this year is supposed to be one of the very best in our lifetimes for viewing the Northern Lights, so Iceland Air is promoting it. Kate’s long wanted to see this phenomenon and as a result of the 2008 financial crisis (which hit Iceland really hard) its currently cheaper to visit Icelend from the continental US than any North American destination where one might see the Aurora Borealis. The Mid Atlantic Ridge runs right through Iceland. 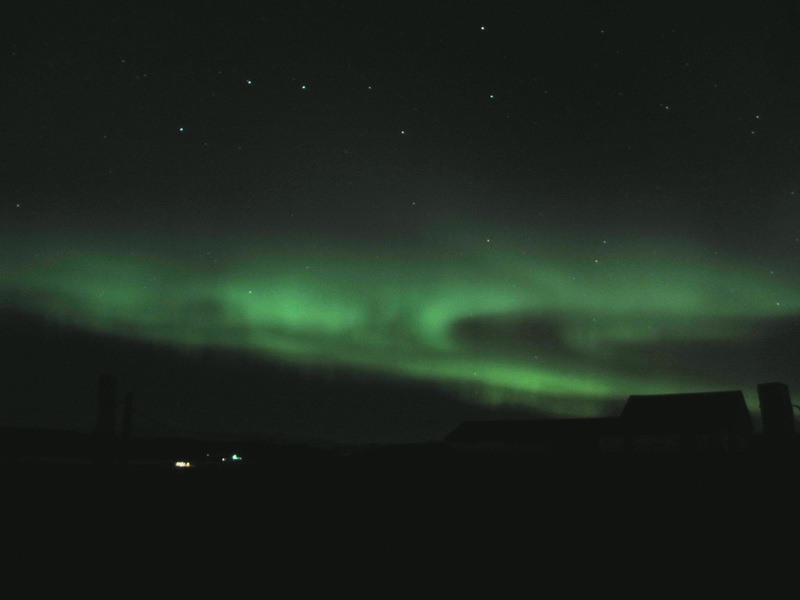 While the main purpose was to see the Northern Lights, Iceland is a really cool place with a lot of intriguing things to see. 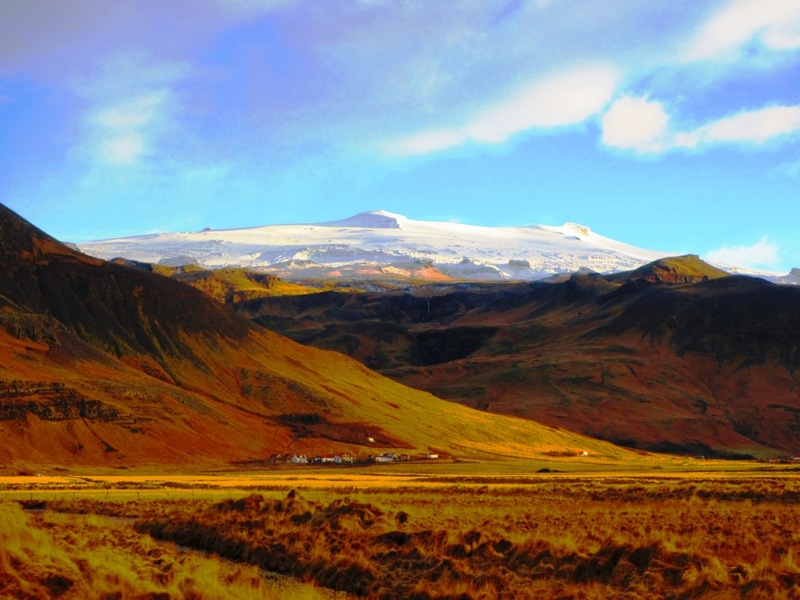 Geologically speaking its absolutely fascinating, with volcanoes, continental rifts and plentiful glaciers (including Vatnijokull, the largest glacier in Europe). 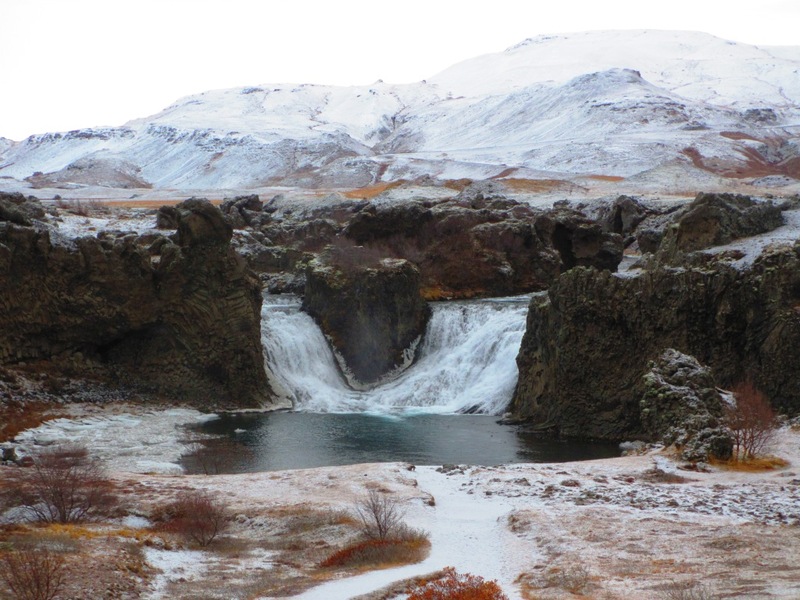 Throw in countless waterfalls, rugged coastline and hot springs everywhere you look. 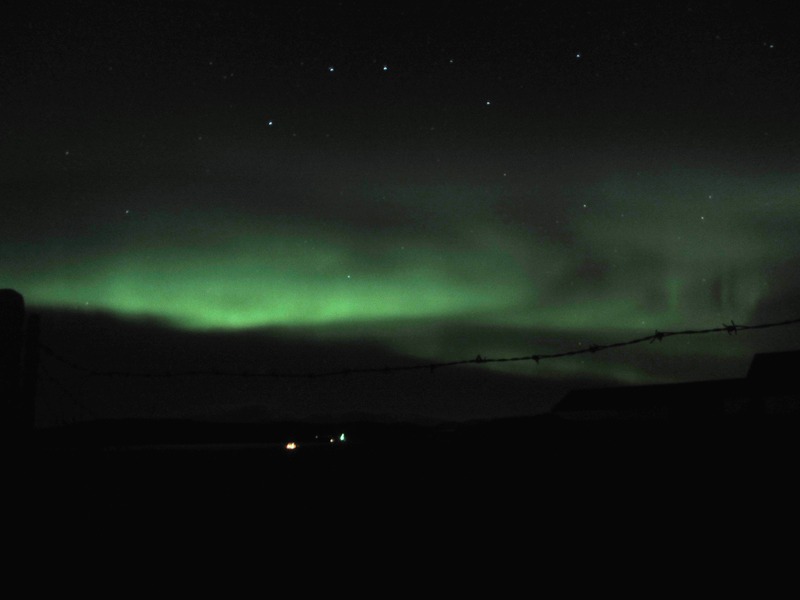 Of course, to see the Northern Lights you need to go in the winter. The darker and colder (and further north) the better. This limited our options somewhat, but due to its location near the Atlantic Gulf Stream, the island never gets terribly cold (the lowest temperature we experienced was about 20 deg F, in the middle of the night). Day time temps were always between 32 and 40 degF. The problem was the incessant wind. If it was calm the place was downright tropical, but occasionally gail force winds made the outside completely unbearable. 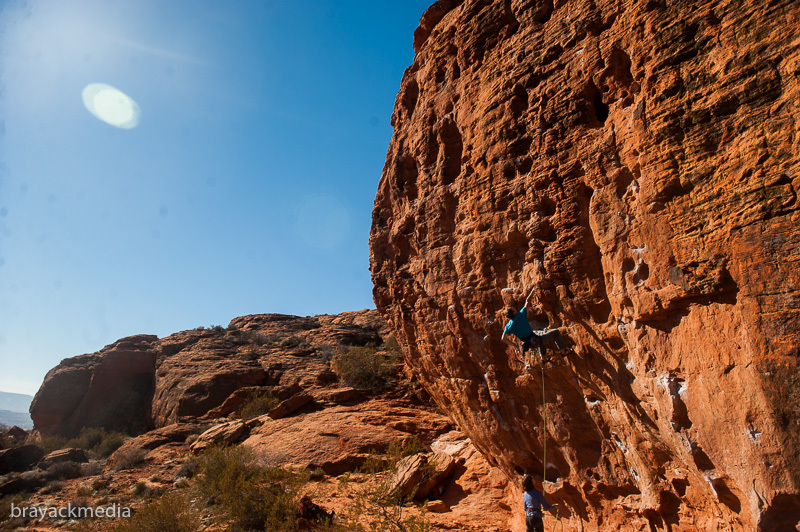 The rock climbing is pretty limited and completely under the radar, but that is not for lack of stone (ice climbing on the other hand is pretty well established). The island has boundless potential for new development, and I was kicking myself on multiple occasions for not bringing a light rack. We had a rope and a handful of draws but no trad gear. Most of the rock is volcanic choss but there are plenty of solid cliffs spread around for those with a discerning eye, and a I spotted a number of incredible features that I would love to climb some day (in the summer!). Tempting sea stacks near Dyrholaey. I reckon the foremost would go at around 5.9 with bomber gear but some tricky choss to negotiate near the top. 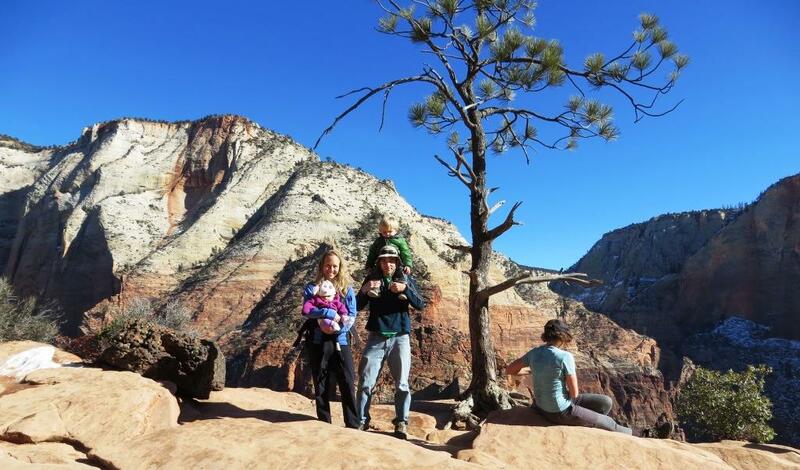 The key to this trip was that Kate’s sister Kendall agreed to care for Logan while we were away. Kate & I were very much looking forward to this aspect of the trip, and that is part of the reason we only went for four days. 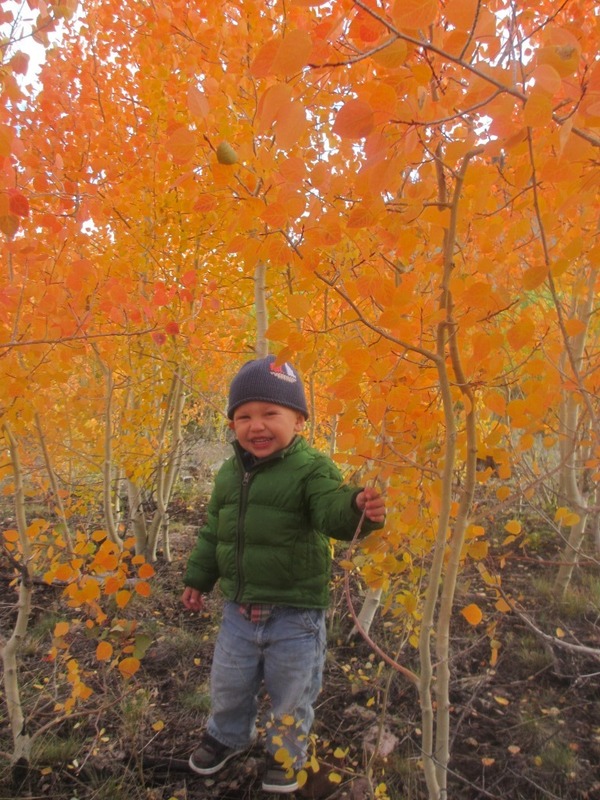 This was our frist time away from Logan for more than 24 hours, so we were pretty psyched but a bit apprehensive. But mostly psyched. We took a 7-hour red eye from Denver direct to Keflavik, arriving in Iceland at 6am local time. I had mapped out an extensive itinerary for each day in order to “maximize fun” as we like to say. The first day was the most demanding, but I figured with the early start we would have more time than any other day. I failed to account correctly for the darkness though. The sun didn’t come up until 9:45, and even then you couldn’t really see all that well for another hour or so. 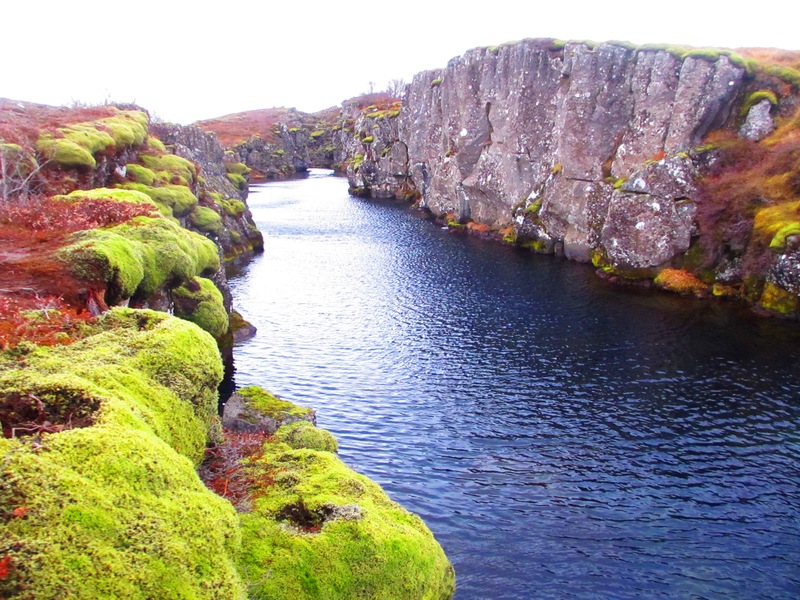 Interesting rock formations in Thingvellir National Park. A rental car is pretty much a must, and they are really expensive; in the neighborhood of $100/day. 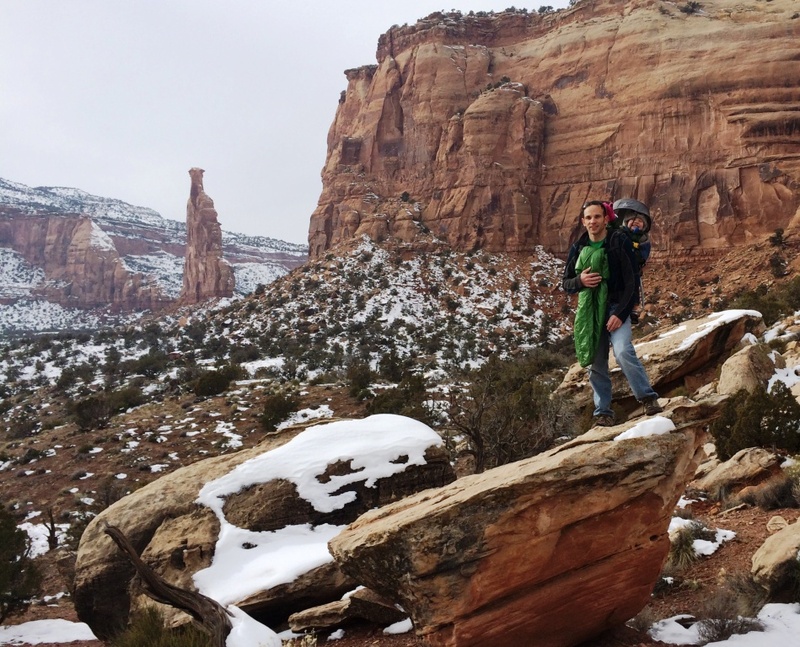 We opted for 4WD, which is probably a wise choice no matter the time of year. There are icey roads all over the place in the winter, and numerous worthwhile dirt roads to explore in the summer. 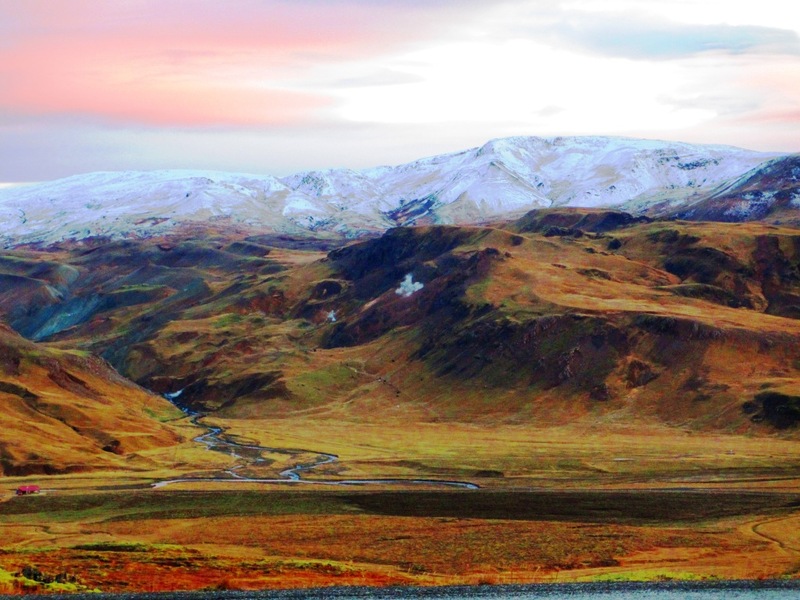 Driving in Iceland can be somewhat treacherous, due primarily to the narrow roads and heinous weather. All of the tourist guides go out of their way to warn travelers of the perils of driving, and the Iceland Air flight even had a special movie on Driving in Iceland, but we’re from Colorado so we know how to drive in bad weather 😉 By looking at off-brand companies I was able to get a nice 4wd Toyota Rav 4 for 10,500 ISK per day (about $80) including taxes and insurance. By the way, this insurance is mandatory and almost worthless, it covers almost nothing except a total loss to the vehicle, in which case you still have to pay a $1500 deductable. Driving on dirt roads or through water voids the insurance–good thing there is none of that in Iceland! A look at Heckla, near where we almost totalled our car. 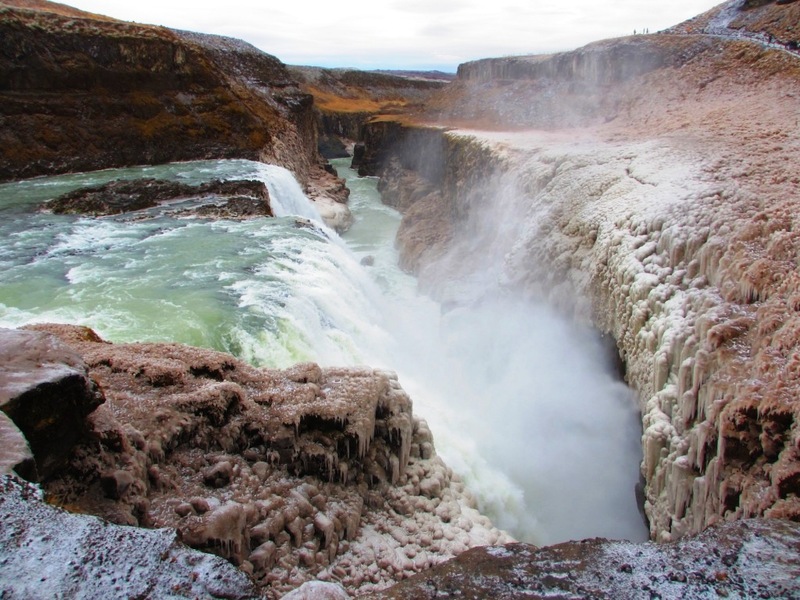 The plan for Day 1 was to basically follow “The Golden Circle” tourist route with a few added excursions. The first really excitement came as the sun was rising and left Highway 1 (the major loop road that circumnavigates the island). We had been buzzing along at 90 km/hr when our vehicles suddenly lost traction and we started fishtailing all over the road. Apparently we had been driving on a sheet of ice for some time. Once I got things under control we got out to see a solid 1/4″ layer of perfectly invisible ice covering everything; even the gravel on the side of the road was slippery to walk on. These burly horses thrive in some really awful weather. 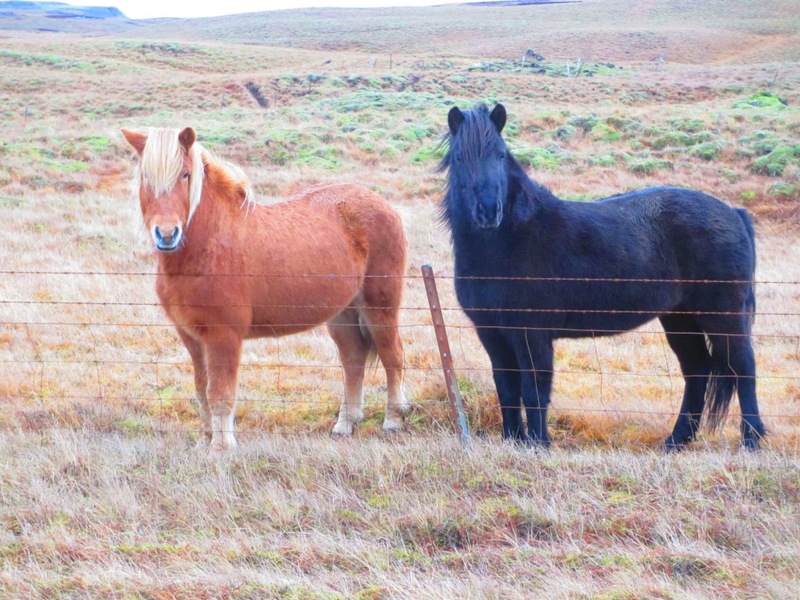 This provided a good opportunity to check out a nearby heard of Icelandic horses. These hearty steeds are quite a bit shorter than regular horses (but they aren’t ponies! ), with wild manes that remind me of Mad Max mullets. They are far more friendly than most horses, and have been pure bread in Iceland for more than 1100 years (the importing of horses to Iceland has been banned since 983 AD). 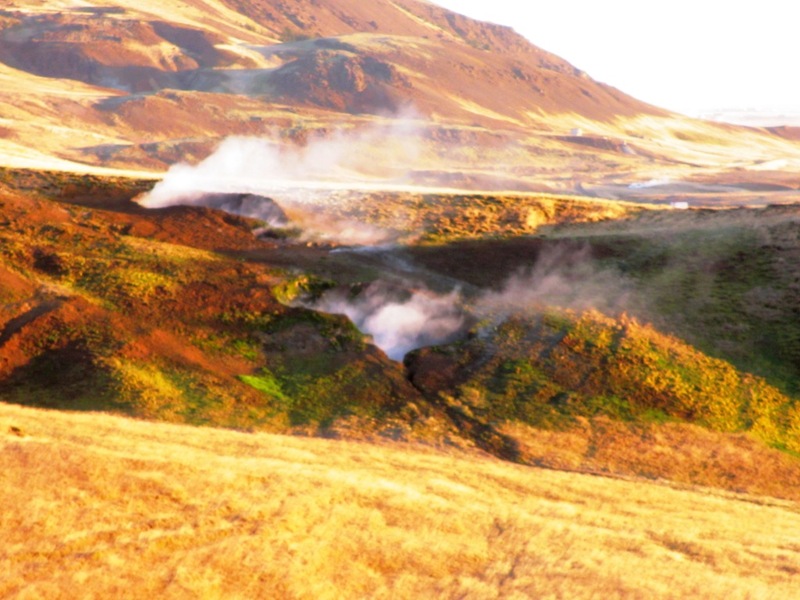 We were also just below Iceland’s most active volcano Heckla. Europeans of the middle ages considered this peak to be quite literally one of two gateways to hell (the other being Stromboli in Italy) after a massive eruption in 1104 AD covered half the island in noxious ash. We proceeded northeast (at a much slower speed) past moon-like volcanic landscapes en route to the ancient Viking village of Stong. This village was completed buried by the 1104 Heckla eruption, and was excavated a la Pompei in 1939 to reveal the only remaining turf homes from the Viking era. 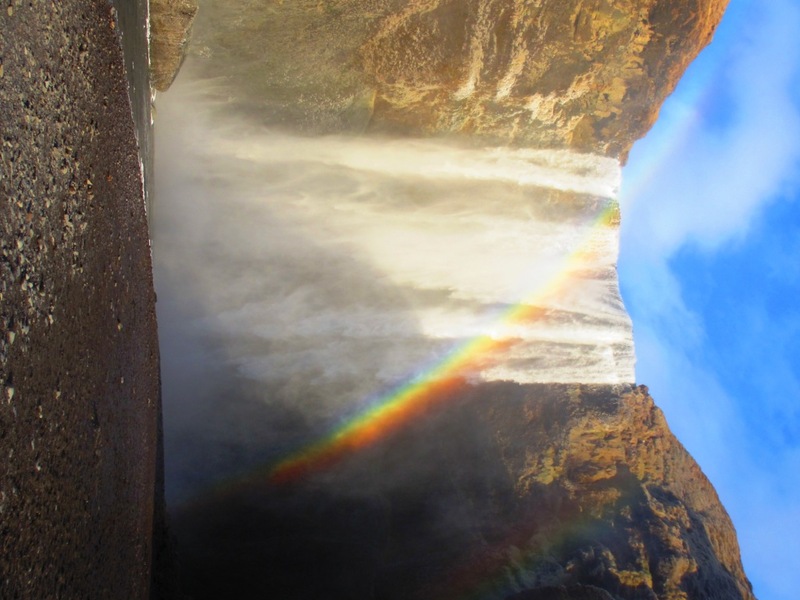 We visited the worthwhile Hjalparfoss en route to the impressive Gulfoss (Golden falls). 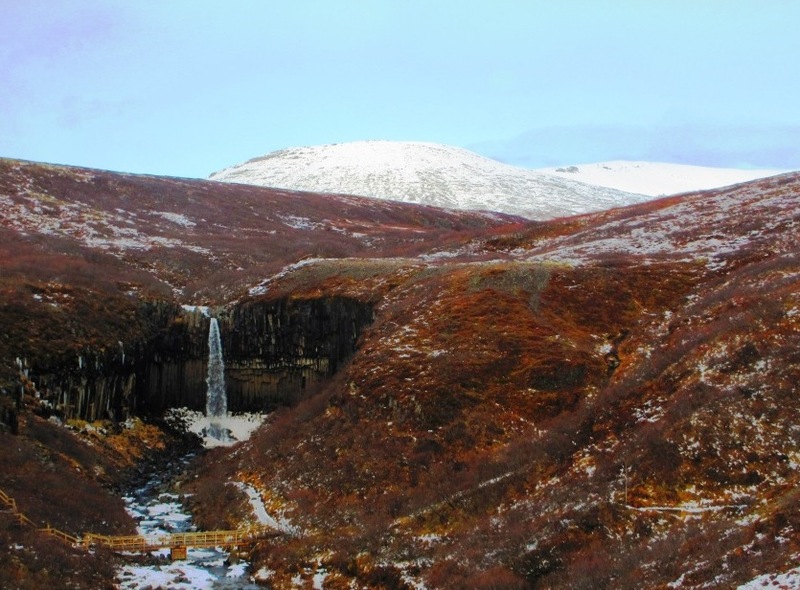 This waterfall was the site of some early environmental activism when Sigridur Tomassdottir threatened to throw herself into the falls to prevent the construction of a dam in the early 1900’s. The falls were very impressive, perhaps more so due to the crazy ice formations lining the canyon. Some of the ice formations down-canyon. Somewhere in there we stopped for gas and what turned out to be our best meal of the trip, a big loaf of fresh bread and a block of some type of sharp local cheese (I should mention gas is very expensive as well, around $7.50 a gallon!). 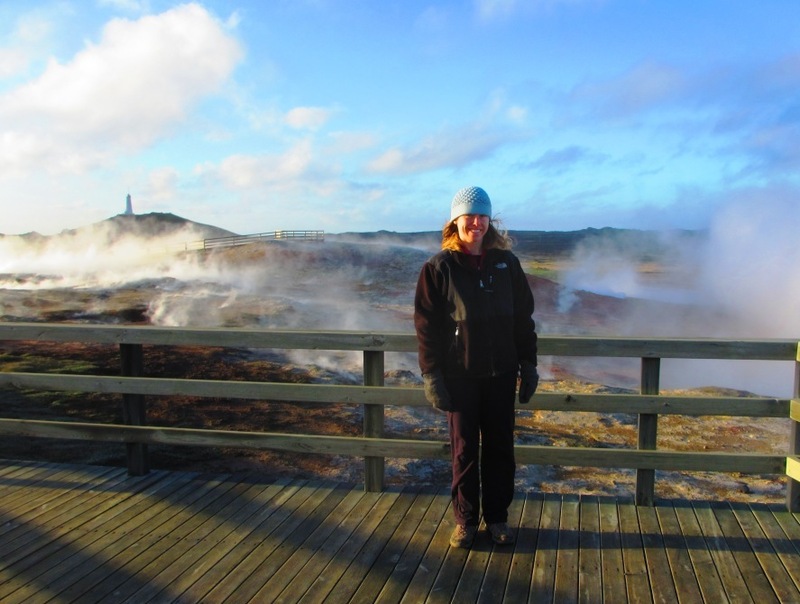 The next stop was “Geysir”, which is the root of the english word “geyser”. This turned out to be about the least interesting of the three geothermal areas we visited in Iceland, but it did have an active geyser (“Srokkur”) that erupted every 5-10 minutes or so. Frankly the geysers of Yellowstone are far more impressive than anything we saw in Iceland, but Iceland is special in that these sites are pretty much everywhere and its easy to have such a place to yourself, unlike Yellowstone. The next and final stop for the day was Thingvellir National Park and UNESCO World Heritage Site. 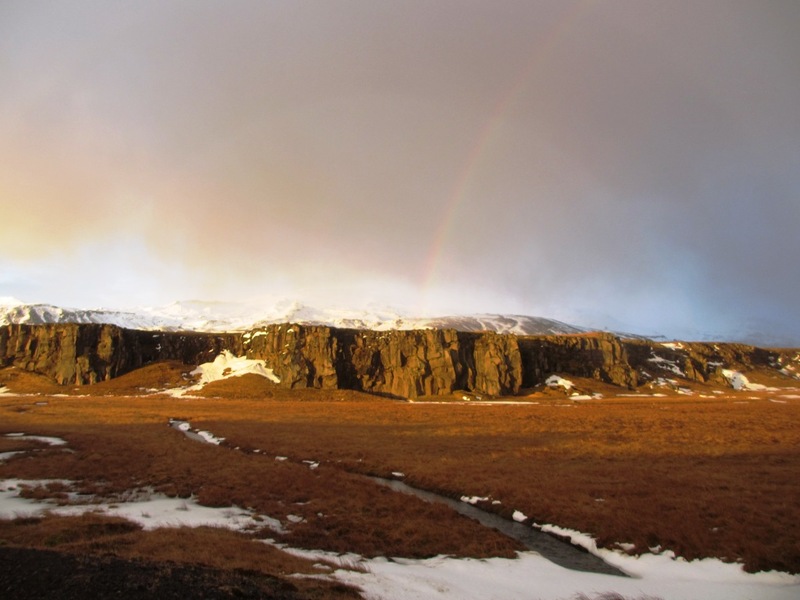 Thingvellir is primarily revered for its historical significance as the site of the “Althing”, Iceland’s original parliment. 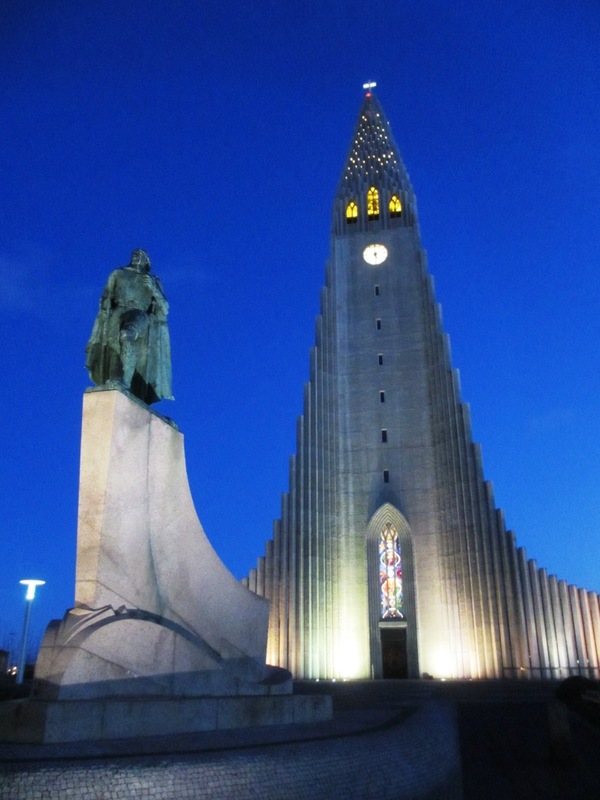 When Iceland was originally colonized in the 800’s, each Viking settler became the “Godar” (literally God, but more like lord) of his local lands. 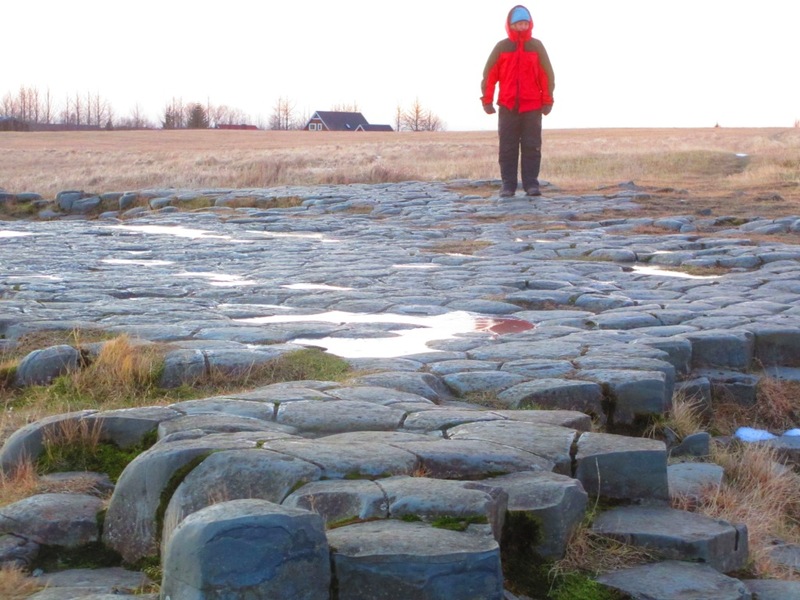 After a few decades problems began to arrise between neighboring Godars, so they decided to assemble once each summer at Thingvellir (literally, “Fields of Parliment”). This is assembly still exists today and is considered perhaps the longest running parliment in the history. 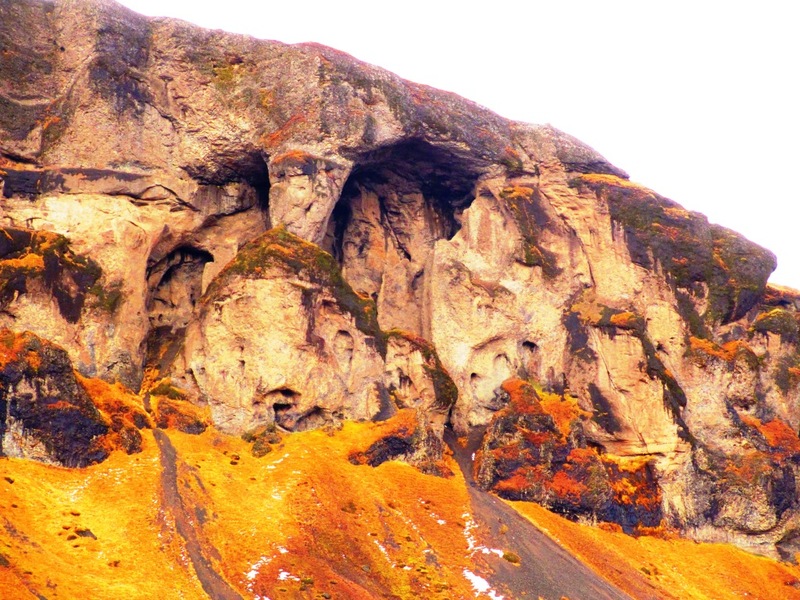 “Law Rock”, site of the Althing. 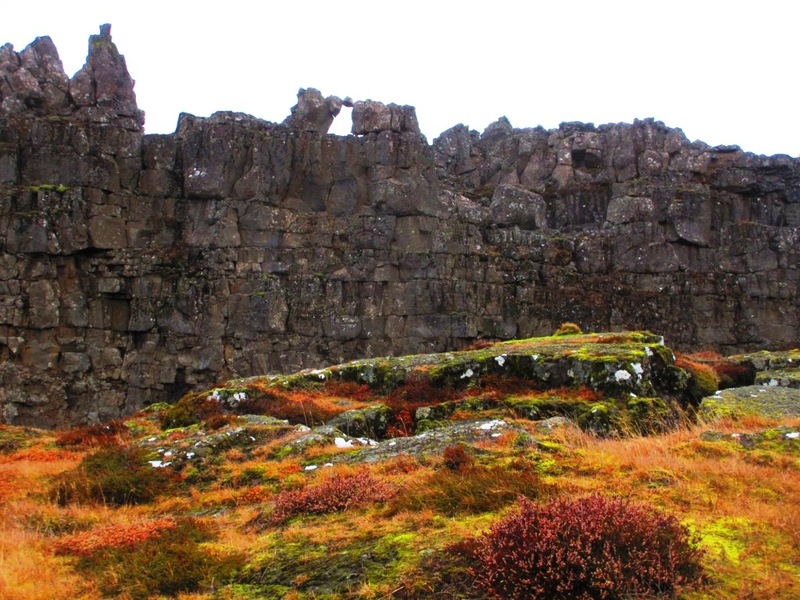 The foreground is the Eurasian Plate, the cliffline is the edge of the North American Plate. 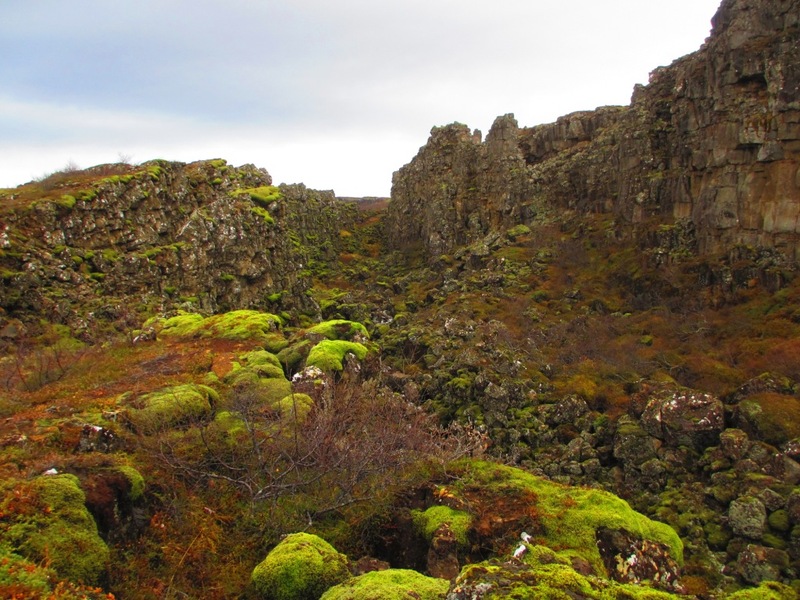 In addition to the human history, the Logberk (“Law Rock” where the Althing convened) sits directly on the Mid-Atlantic Ridge (the divergent boundary of the North American and Eurasian tectonic plates). 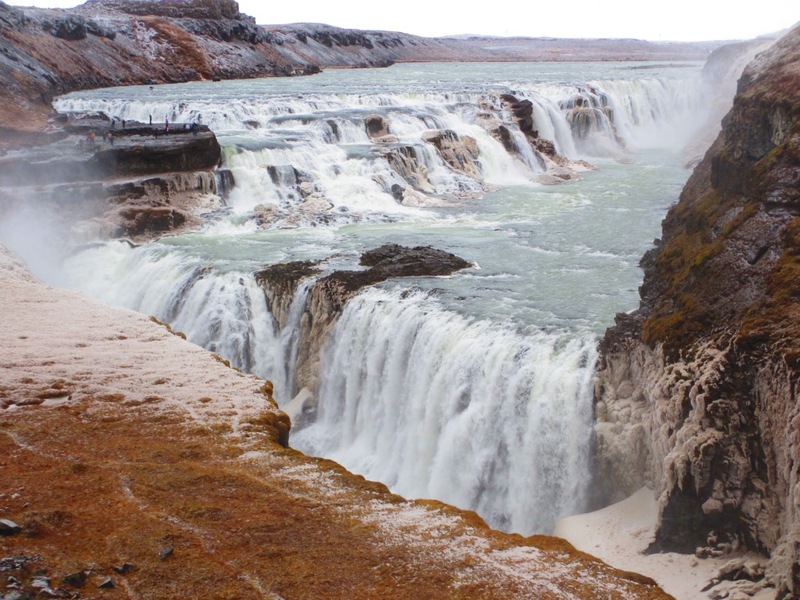 The cool little canyon is growing at a rate of about 1″ per year, and the Oxararfoss waterfull tumbles into the Ridge, flows down it a while, then spills out. 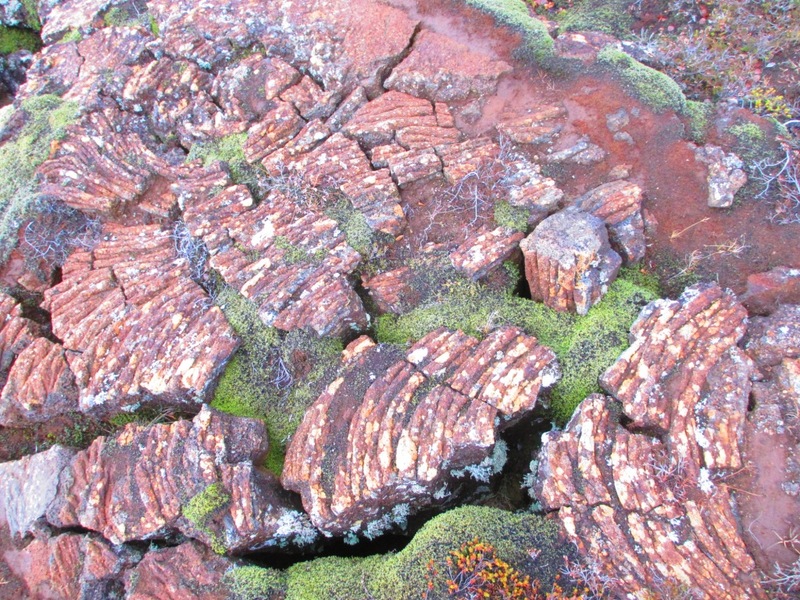 The area is litered with cool little fissures and other signs of geologic activity. 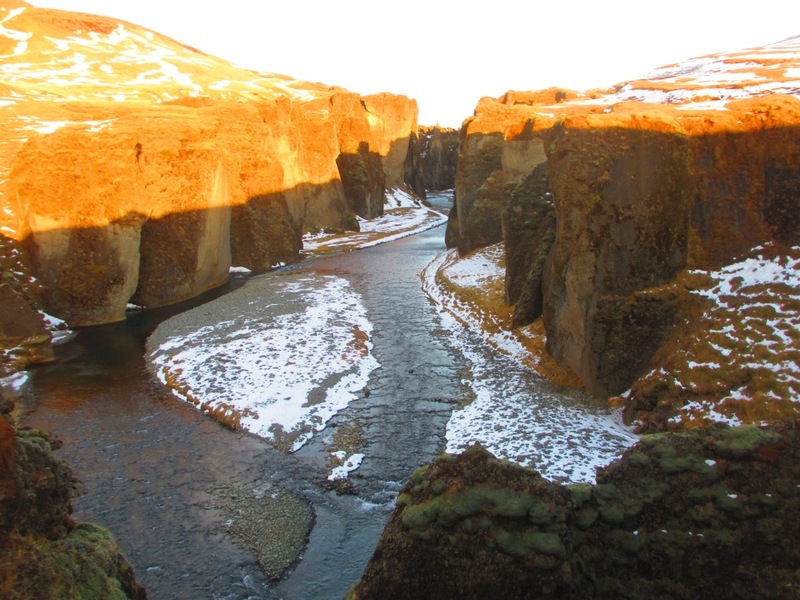 The Flosagja fissure is filled with glacial runoff and is a popular spot for SCUBA diving. 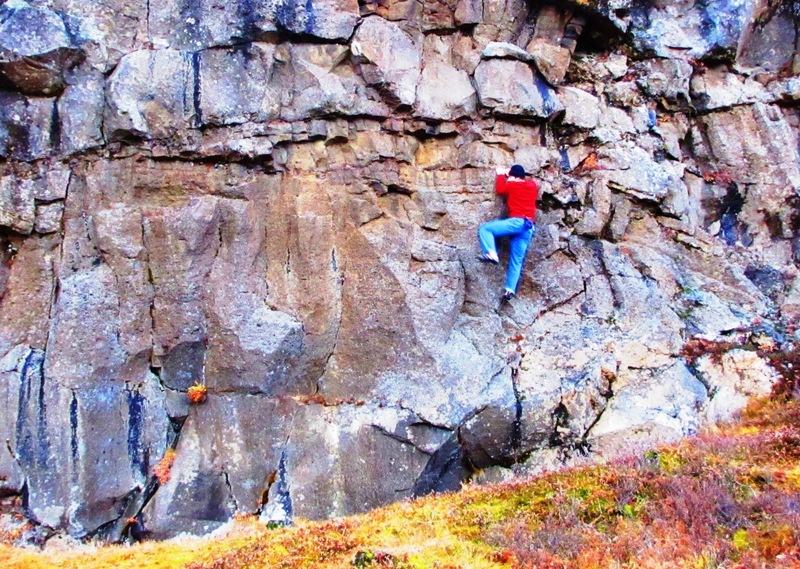 I found a nice clean section of basalt on the edge of the North American Plate and did some fun bouldering. The rock was really nice but I assume the locals would frown on further exploitation by climbers. One nice thing about visiting in November is that we had most places to ourselves. Some fun bouldering on the eastern edge of the North American Plate. Next we cruised into Reykjavik to check into our hotel. 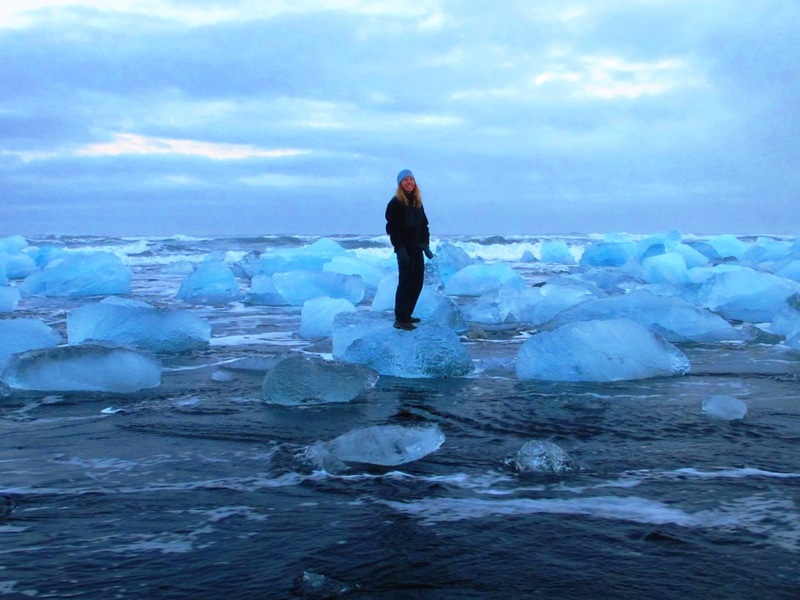 The trip package included lodging in an Iceland Air-owned hotel in Reykjavik, which was probably our biggest mistake. 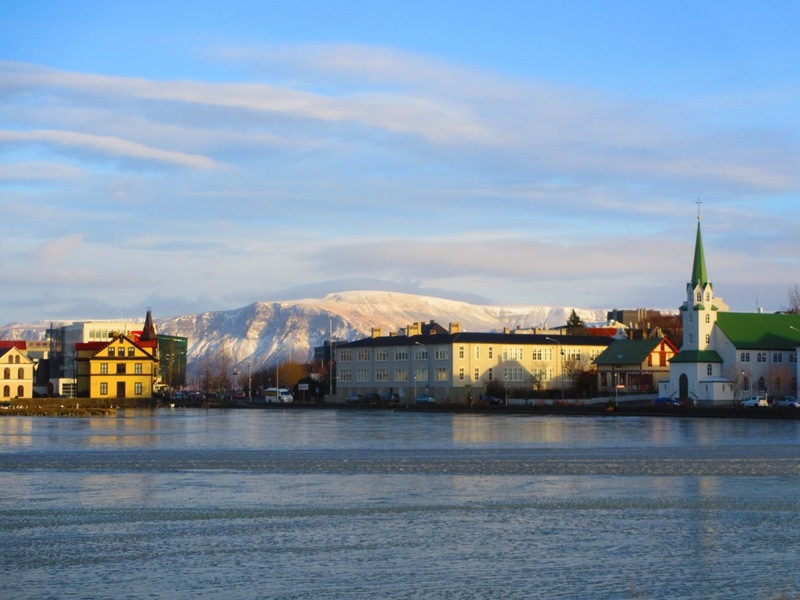 If going to Iceland, there’s little reason to spend more than one or two nights in Reykjavik. Best to spend the other time out in the country. 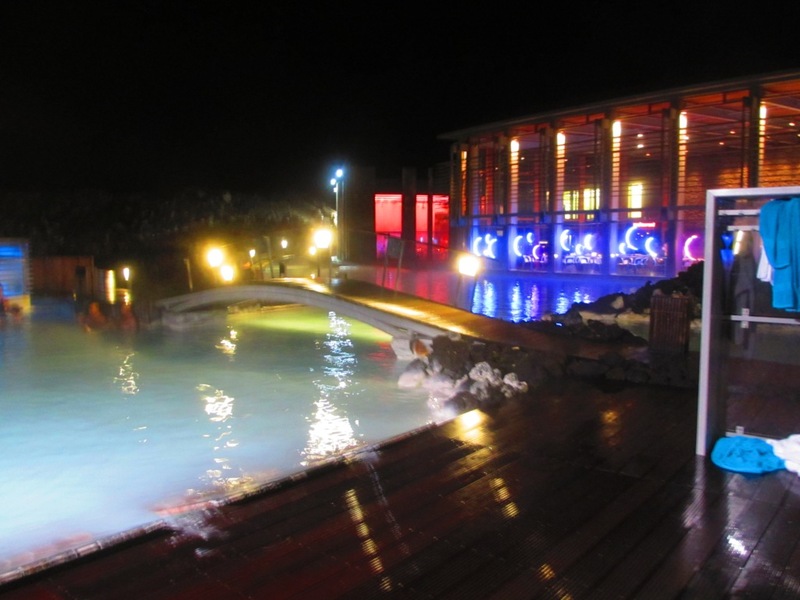 After a brief stop we decided to head to the Blue Lagoon, Iceland’s most famous hot spring. This place is a Disney-style operation, with conveyer-belt style efficiency design to funnel heards of people in and out. Fortunately there were only 30 or so other tourists there that night so it wasn’t a circus. The minerals in the water give it a milky blue color, and are said to be really good for the skin. Although the place is a bit of a travesty from an ecological perspective, it was a really fun, relaxing experience, and the pool is interesting with little bridges and waterfalls. The Blue Lagoon, not as blurry in real life. We got back to the hotel at about 8:30 pm, completely exhausted (having been awake for about 33 hours). That’s about enough for Part 1, I promise to skip all the endless rambling about history in Part II.